This edition of the IAS Newsletter is Copyright © 2009 by the International Aroid Society, Inc. 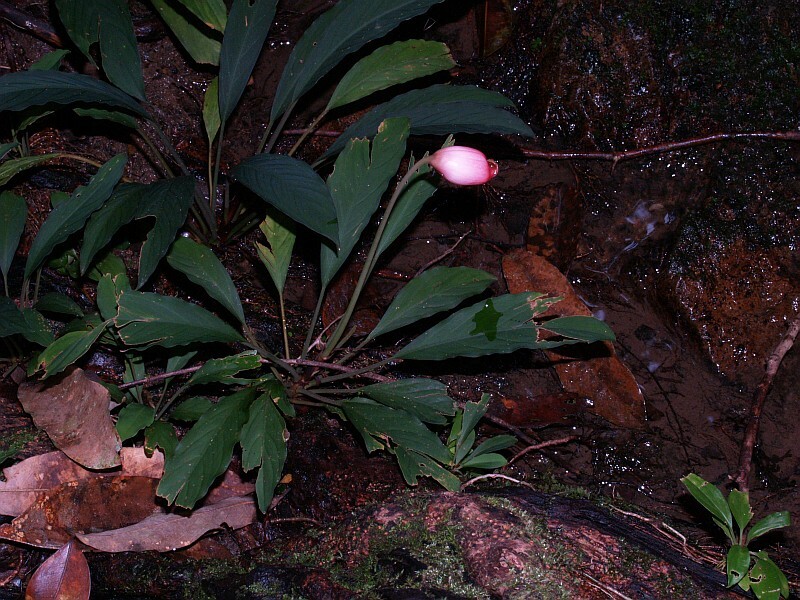 The limestone (batu kapur in the local Bahasa Melayu) areas of Sarawak are among the most rewarding for searching for aroids, not only in terms of species richness but also species diversity. A particularly striking aspect of the limestone flora is that spatially close areas of limestone, often only a few kilometres distant, often have strikingly different species composition. Map 1. 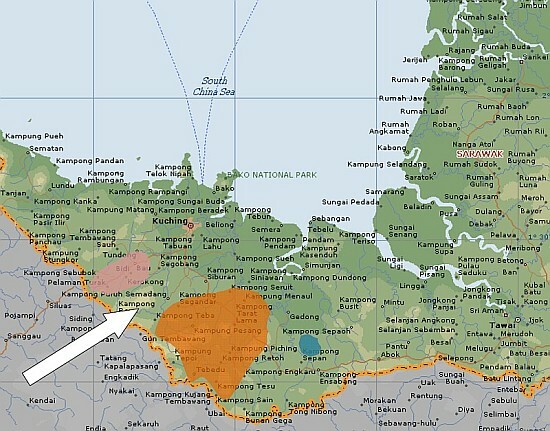 West Sarawak showing the Bau (pink), Padawan (orange) and Ranchan (blue) limestones. The Bongo Range is marked with a thick arrow. Over the past few years we have been investigating three areas of limestone in western Sarawak. One area is the Bau series limestones in Kuching Division. 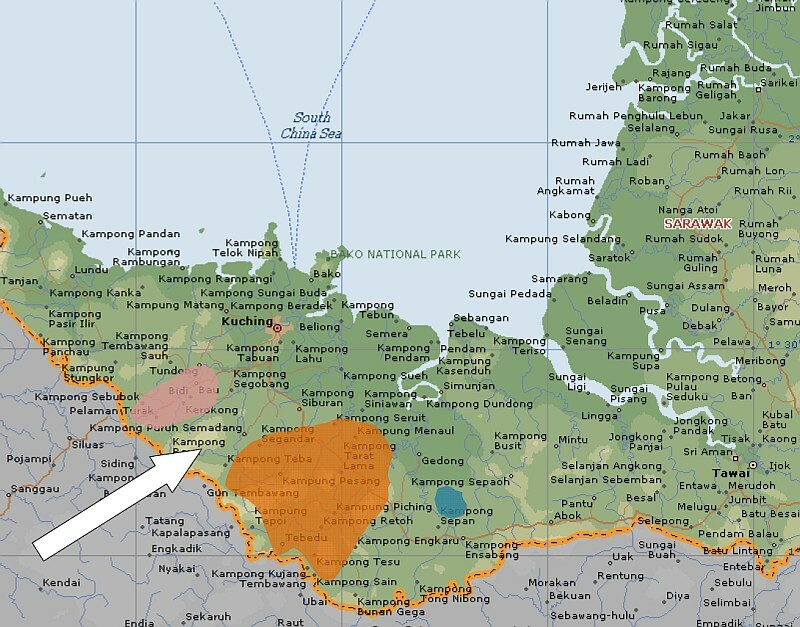 Another is the Padawan series that run through the southern parts of Kuching and Samarahan divisions towards the border with Kalimantan (Map 1). These are in the main areas of often very large exposed karst fossliferous limestones dated to the Jurassic and Cretaceous periods. We have also been studying the Ranchan limestones on the outskirts of Serian. These are very old, in parts Permian, argillaceous limestones and mark the eastern-most block of the western Sarawak limestones. 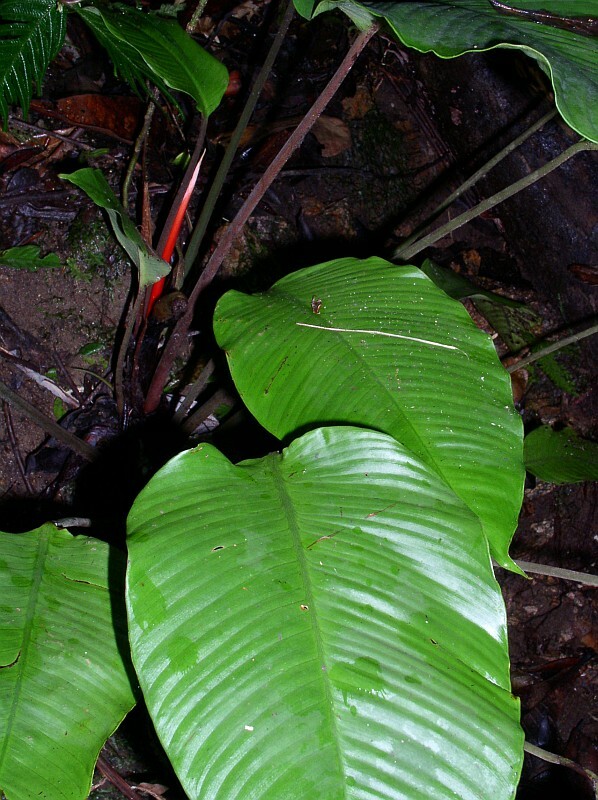 All these limestone areas have high levels of local endemism, notably in the genera Amorphophallus, Alocasia, Schismatoglottis, and Homalomena. 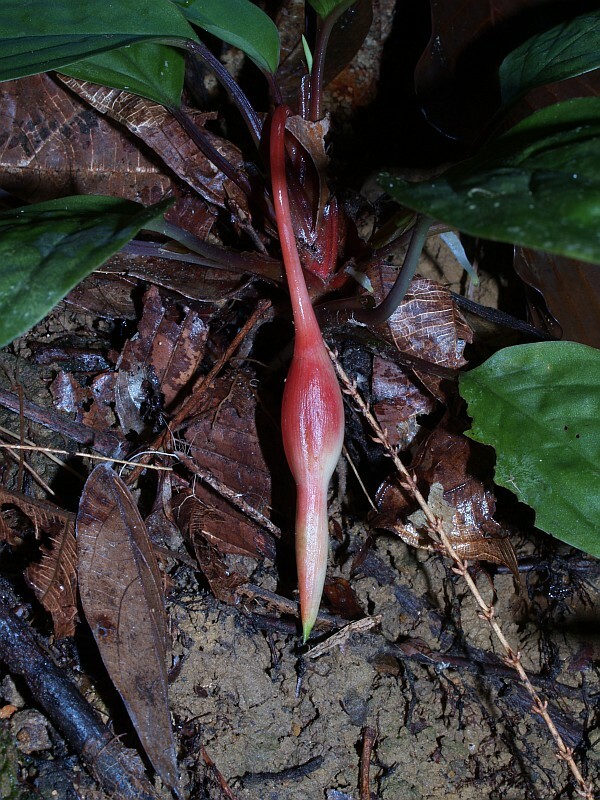 Additionally, there are suites of species that while not locally endemic in western Sarawak are restricted to limestones wherever they occur in Borneo. Figure 1. 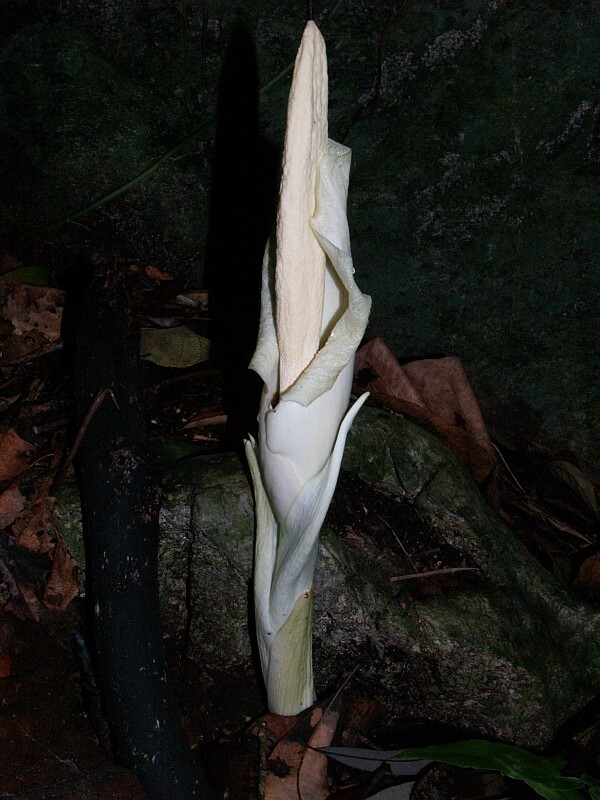 Amorphophallus brachyphyllus Hett., a common species on the Bau limestones. Figure 2. Amorphophallus eburneus Bogner, replaces A. brachyphyllus Hett. on the Padawan limestones but is absent from the close-by Ranchan series. Figure 3. 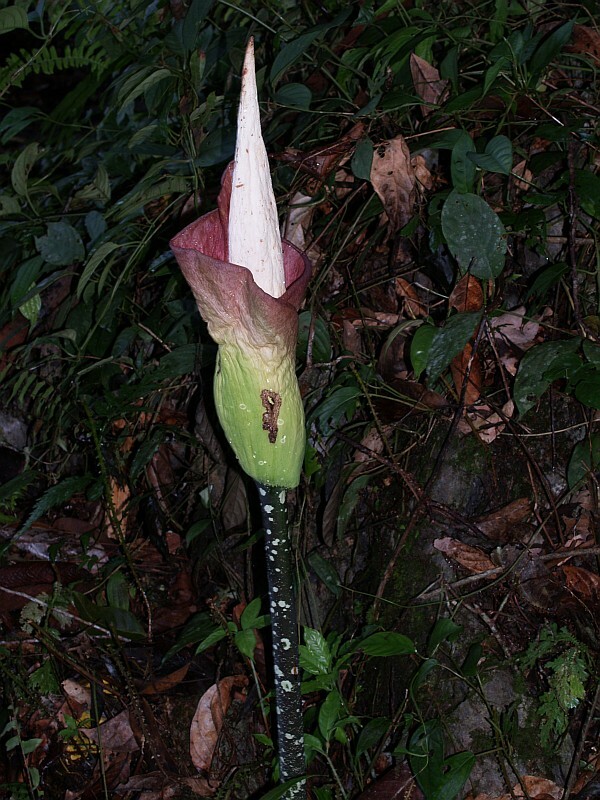 Amorphophallus ranchanensis Ipor, Tawan, A.Simon, Meekiong & Fuad, endemic to the Ranchan limestones on the outskirts of Serian. Figure 4. 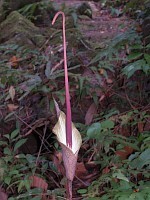 Amorphophallus hewittii Alderw., as currently defined a widespread and variable species but perhaps comprising several as yet undescribed species. 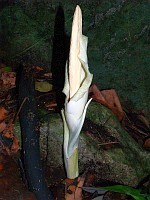 Amorphophallus is one of the most striking genera of the Sarawak limestones. The area around Bau hosts A. brachyphyllus Hett. 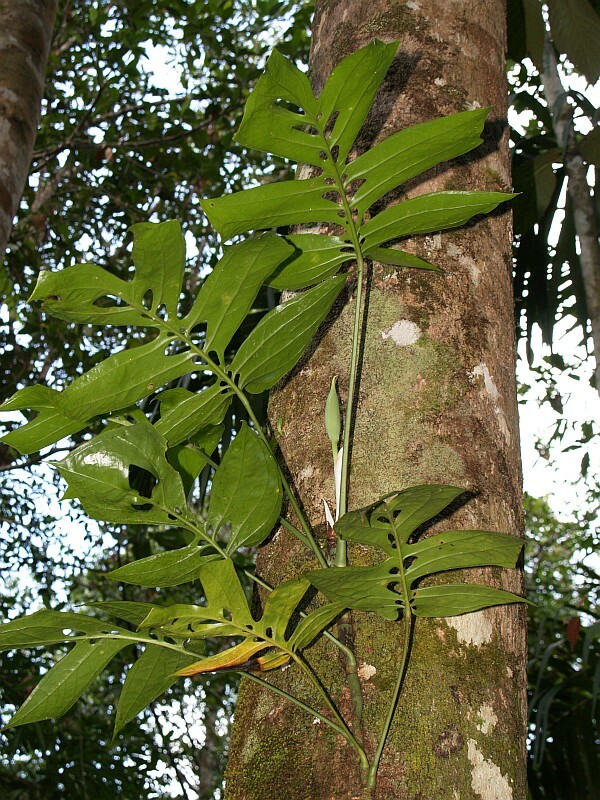 (Figure 1), which is replaced by the closely related A. eburneus Bogner (Figure 2) on the Padawan series, and by the recently described A. ranchanensis Ipor, Tawan, A.Simon, Meekiong & Fuad at Ranchan (Figure 3). The last named is particularly interesting in that its relationships appear to lie with the east Bornean, A. hottae Bogner & Hett., rather than with any of the currently known species in western Borneo. However, there exists the distinct possibility that as further work is undertaken in Sarawak yet more species will be discovered that fill the geographical gap between these Western and Eastern taxa. Amorphophallus hewittii Alderw. 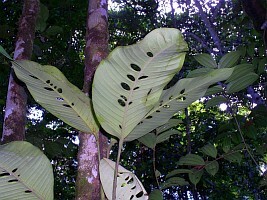 (Figures 4) occurs on all the western Sarawak limestones and, unusually for a limestone-occurring Amorphophallus, also occurs on other geologies, including sandstones (as on the Matang Massif and across the Sarawak River at Gunung Muan) and granite (e.g., at Gunung Gading). One possibility is that the limestone elements represent a species distinct from the plants on other geologies. Figure 5. Alocasia ridleyi A.Hay, a limestone-occurring species restricted to west Sarawak but related to limestone-obligate species in Sabah. Figure 6. 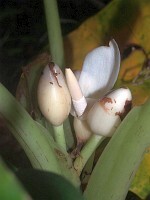 Alocasia ridleyi A.Hay, in flower and young fruit. Figure 7. Alocasia scabriscula N.E.Br., common in swampy areas in full sun. Figure 8. 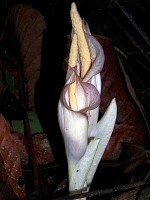 Alocasia scabriscula N.E.Br., plants can flower and fruit prolifically. 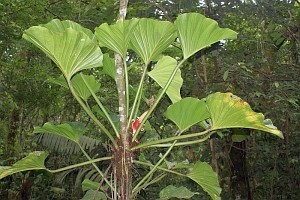 Alocasia is another feature of the Sarawak limestones. Alocasia ridleyi A.Hay (Figures 5 & 6) occurs on all three of the western Sarawak limestone formations, although is commonest on the Bau series. 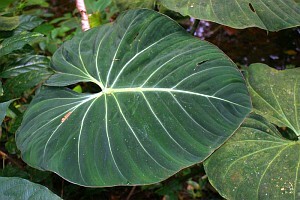 Alocasia ridleyi is one of a number of similar species restricted to limestone in Borneo. 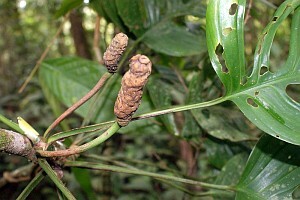 In the same group as A. ridleyi is A. puteri A.Hay and A. pangeran A.Hay, both restricted to Sabah while a related species, A. scabriuscula N.E.Br. (Figures 7 & 8) occurs throughout much of Borneo, often in rather swampy places. By comparison, A. reversa N.E.Br. (Figures 9 & 10) is restricted to the Padawan series, and is replaced by an as yet undescribed species on the Bau series. Figure 9. 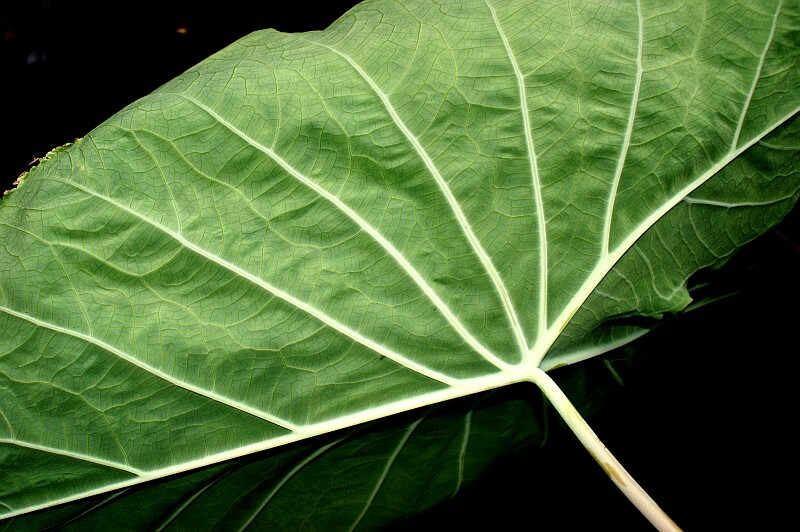 Alocasia reversa N.E.Br., a very attractive species from the Padawan limetsones. Figure 10. 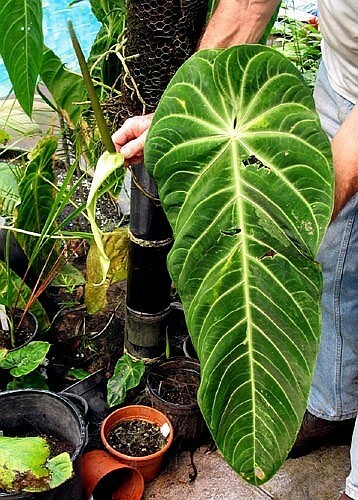 Alocasia reversa N.E.Br. Figure 11. Schismatoglottis nervosa Ridl., remarkable for the strong veined leaves and powerful terpenoid smell of the crushed tissues. Figure 12. Schismatoglottis nervosa Ridl. Figure 13. Schismatoglottis nervosa Ridl., showing the distinct, longitudinally-ribbed petioles. Figure 14. Schismatoglottis bauensis A.Hay & C.Lee, covering a limestone cliff at the type locality. Figure 15. Schismatoglottis bauensis A.Hay & C.Lee, showing the petiolar sheath with long, free ligules. Figure 16. Schismatoglottis bauensis A.Hay & C.Lee, showing the bright pink innovations. Both Schismatoglottis and Homalomena are abundant on the Sarawak limestones, although the patterns of species distribution are far from resolved. A striking feature of the Bau and Padawan limestones is a species of Schismatoglottis, S. nervosa Ridl., with ribbed petioles and tissues that are strongly aromatic of terpenes (Figures 11, 12 & 13). At Bau, but absent from Padawan and Ranchan, S. bauensis A.Hay & C.Lee forms large colonies on vertical limestone cliffs (Figure 14) and is readily identified by the long free ligular portion to the petiolar sheath (Figure 15) and bright pink innovations (Figure 16). 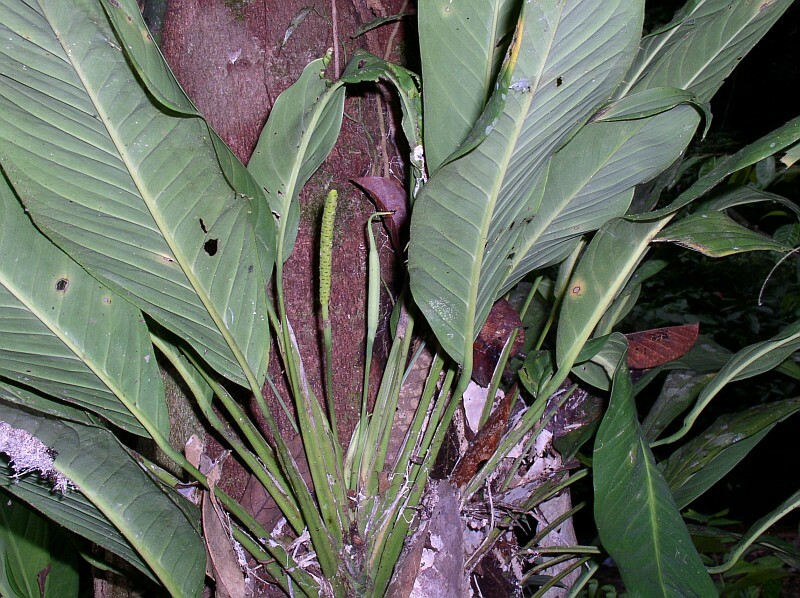 Schismatoglottis calyptrata (Roxb.) Zoll. & Moritzi is abundant at all three limestone areas covered here and forms large colonies with bright green cordate leaves and the typical large, clavate appendix that is diagnostic for the species (Figures 17-18). Perhaps the most extraordinary species so far found, S. convolvula P.C.Boyce (Figure 19), is very locally abundant on the Padawan limestones. Figure 17. 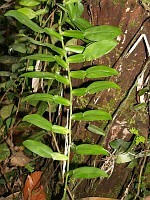 Schismatoglottis calyptrata (Roxb.) Zoll. & Moritzi, colony on a limestone ledge. Figure 18. 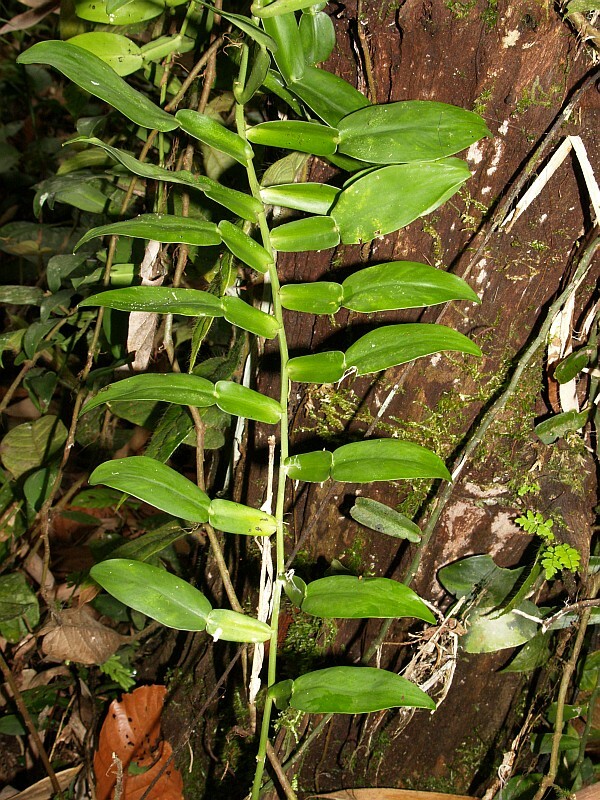 Schismatoglottis calyptrata (Roxb.) Zoll. & Moritzi, showing the distinctive clavate spadix appendix. Figure 19. Schismatoglottis convolvula P.C.Boyce, the only Schismatoglottis species found to date with twining and climbing stems. Figure 20. Homalomena griffithii (Schott) Hook.f. Figure 21. 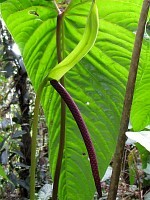 Homalomena griffithii (Schott) Hook.f., inflorescence at male anthesis, note the spadix angled forward and the open spathe. Figure 22. 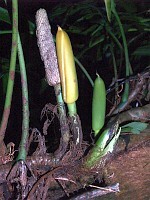 Homalomena griffithii (Schott) Hook.f., inflorescence at late male anthesis, with the spadix once again upright and the spathe beginning to close. Figure 23. Homalomena insignis N.E.Br. Figure 24. Homalomena insignis N.E.Br. Homalomena that commonly occur include H. griffithii (Schott) Hook.f. (Figures 20-22) and H. insignis N.E.Br. (Figures 23-25). 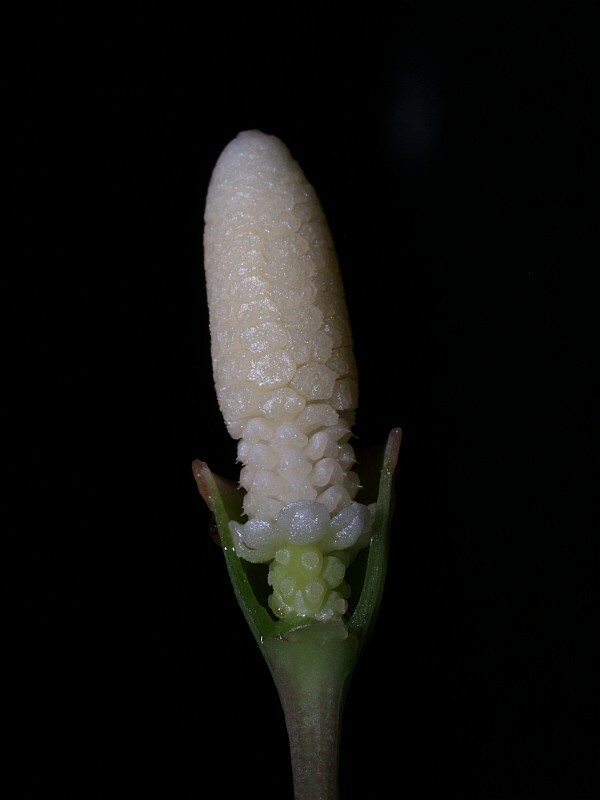 Homalomena and Schismatoglottis are frequently confused by non-specialists but are readily separable on inflorescence characteristics. In Schismatoglottis, the spathe limb is almost always shed during flowering (Figure 26), resulting in an infructescence that is fusiform with an open orifice (Figure 27). 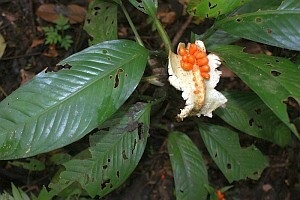 When ripe, the persistent lower spathe splits from the top, peeling back and reflexing to reveal the berries which, owing to the female flower zone being fused to the spathe, are held to one side (Figure 28). 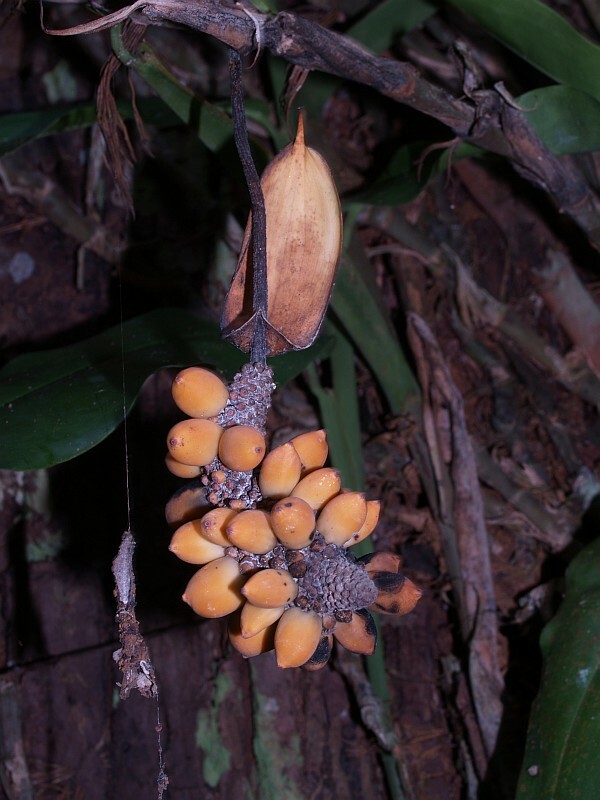 By comparison, the entire spathe persists into fruiting in Homalomena (Figure 29) and, at maturity the spathe splits from the base and curls upwards to reveal the cylindrical cluster of berries on their free stipe (Figures 30 & 31). Figure 25. Homalomena insignis N.E.Br., infructescence. Figure 26. 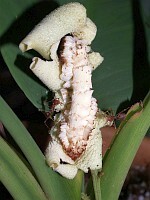 Schismatoglottis sp., showing the spathe limb shedding during anthesis. Figure 27. 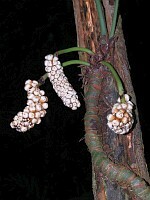 Schismatoglottis sp., showing an immature and a mature infructescence. Figure 28. 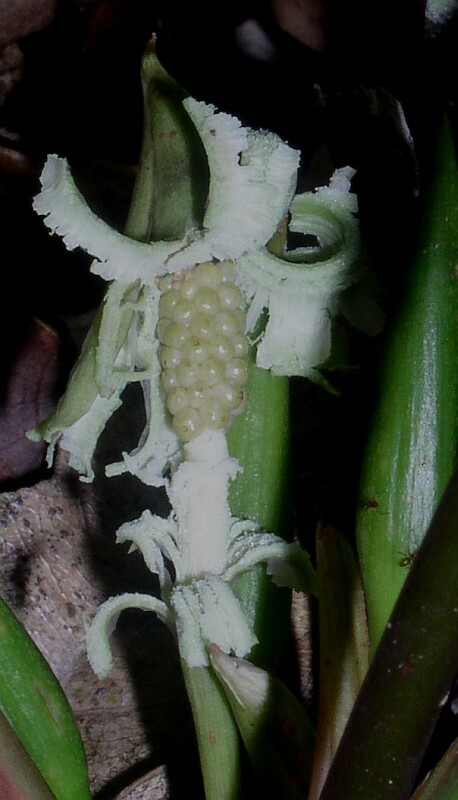 Schismatoglottis sp., showing the persistent lower spathe splitting and recurving from the top to reveal the fruits; the fruits are partially adnate to the spathe. Figure 29. 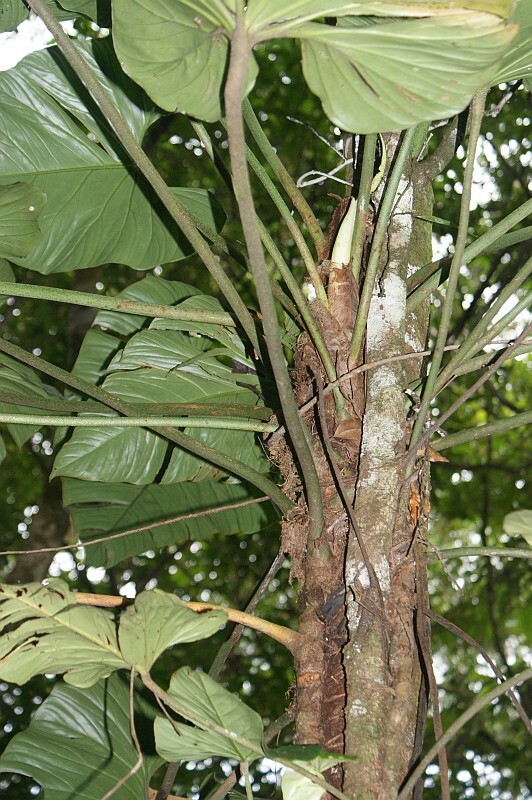 Homalomena borneensis Ridl., infructescences showing the persistent spathe. Figure 30. Homalomena griffithii (Schott) Hook.f., infructescences showing the persistent spathe splitting basally and then flexing upwards to reveal the free infructescence. Figure 31. Homalomena insignis N.E.Br., infructescences with the persistent spathe artificially removed just prior to fruit ripening. Figure 32. Bucephalandra motleyana Schott. Figure 33. Bucephalandra motleyana Schott, inflorescence at early male anthesis, the spathe limb just beginning to shed. Figure 34. 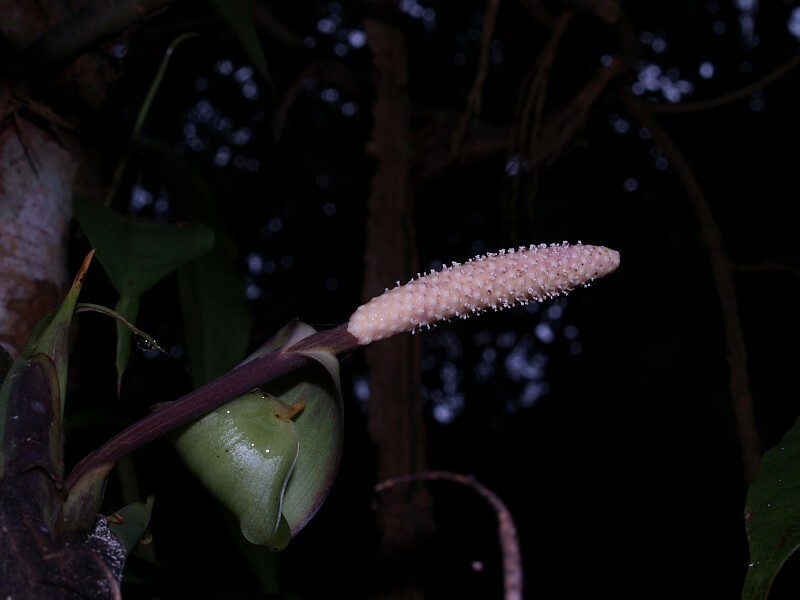 Bucephalandra motleyana Schott, inflorescence at male anthesis, spathe limb shed and lower spathe opened artificially to show the shield-shaped staminodes between the male and female flower zones. Figure 35. Piptospatha viridistigma P.C.Boyce, S.Y.Wong & Bogner. Figure 36. 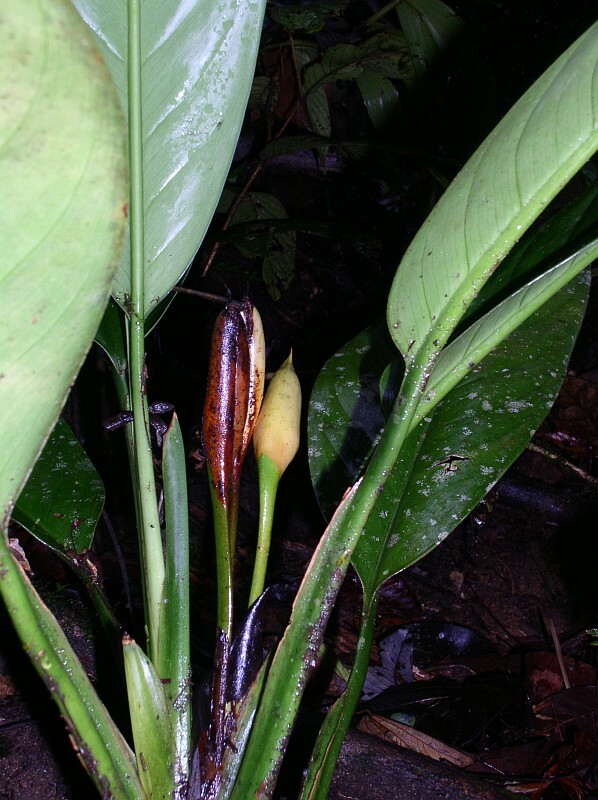 Piptospatha viridistigma P.C.Boyce, S.Y.Wong & Bogner, fruiting spathe showing the splash-cup. 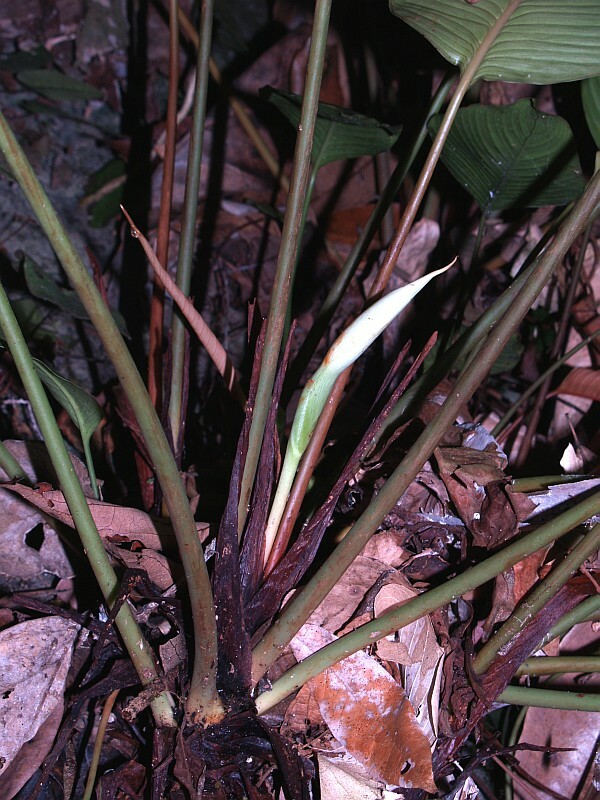 The rheophytic genera Bucephalandra and Piptospatha are closely related to Schismatoglottis and differentiated most readily by lacking a constriction at the junction of the lower and upper spathe, and a splash-cup infructescence, and from each other by spathe colour (white in Bucephalandra, pink in most Piptospatha), and the presence or absence of shield-shaped staminodes between the male and female flower zones –staminodes being present in Bucephalandra and absent in Piptospatha. 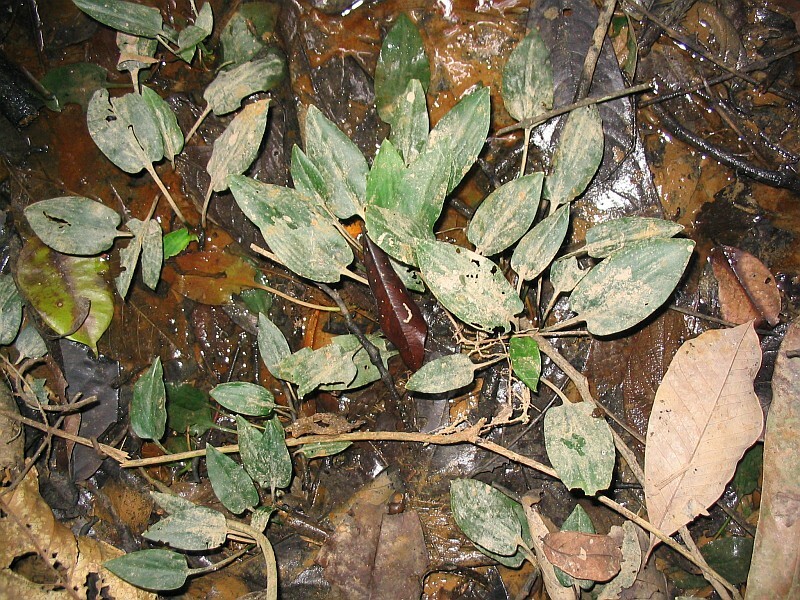 Bucephalandra motleyana Schott is absent north of the Bongo Range and thus does not occur on the Bau limestones; however it is locally abundant on the Padawan and Serian limestones where it often forms large single-species colonies (Figures 32-34). 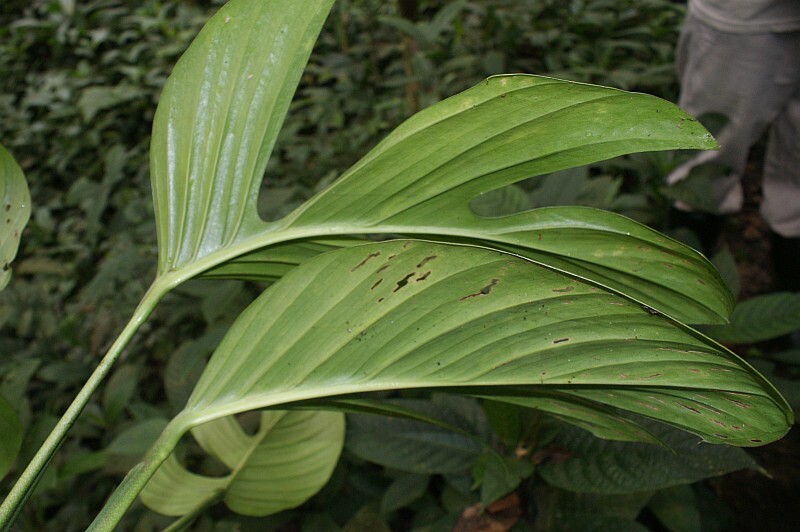 Although Piptospatha does occur north of the Bongo Range, for example P. elongata (Engl.) N.E.Br. 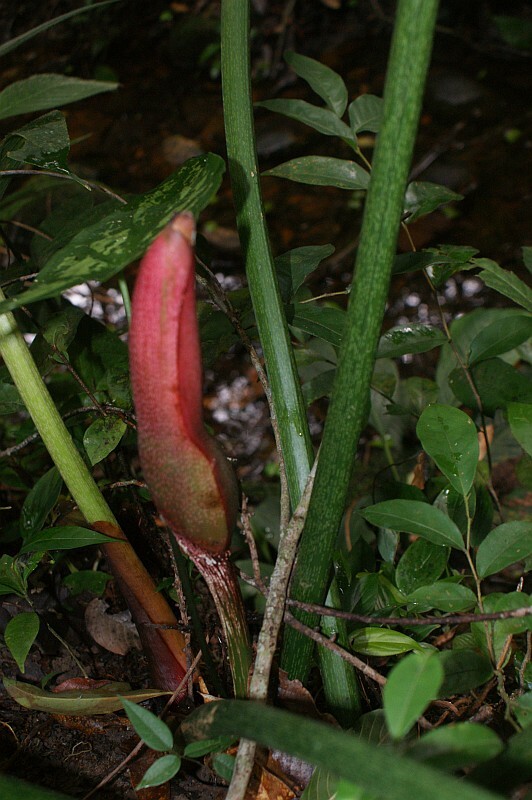 on the Lundu granites, there are no limestone-occurring species until south of the range where the recently described P. viridistigma P.C.Boyce, S.Y.Wong & Bogner is locally common on both the Padawan and Ranchan series (Figures 35 & 36). Figure 37. Cryptocoryne ferruginea Engl. Figure 38. Cryptocoryne ferruginea Engl., flowering plant. Figure 39. Aglaonema simplex (Blume) Blume. Figure 40. Aglaonema nitidum (Jack) Kunth. Cryptocoryne ferruginea Engl. 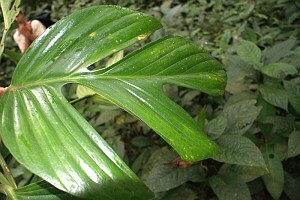 is locally abundant in pools at the base of limestone cliffs in Bau, the leaves are often attractively bullate (Figures 37 & 38). 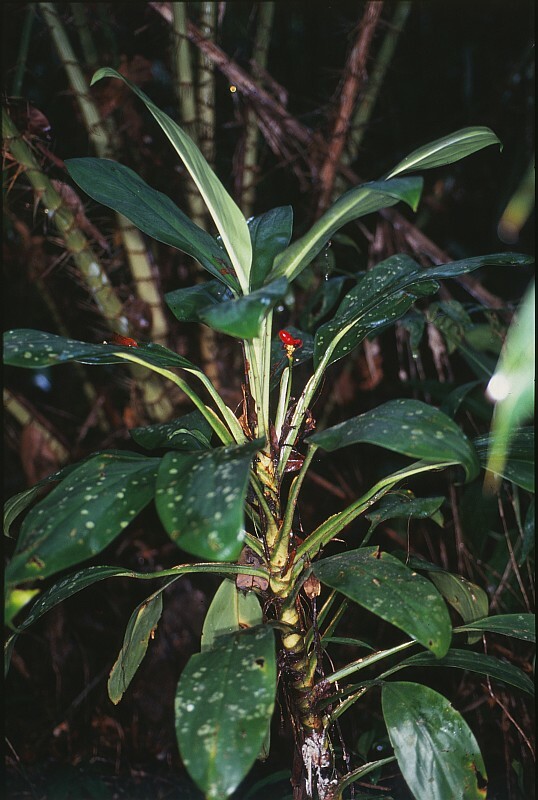 The suffruticose genus Aglaonema is represented only by A. simplex (Figures 39 & 40) on exposed limestone, although A. nitidum (Jack) Kunth is frequently encountered nearby where the limestone is not exposed; A. simplex (Blume) Blume is not restricted to limestone and is a widespread and often very common species. 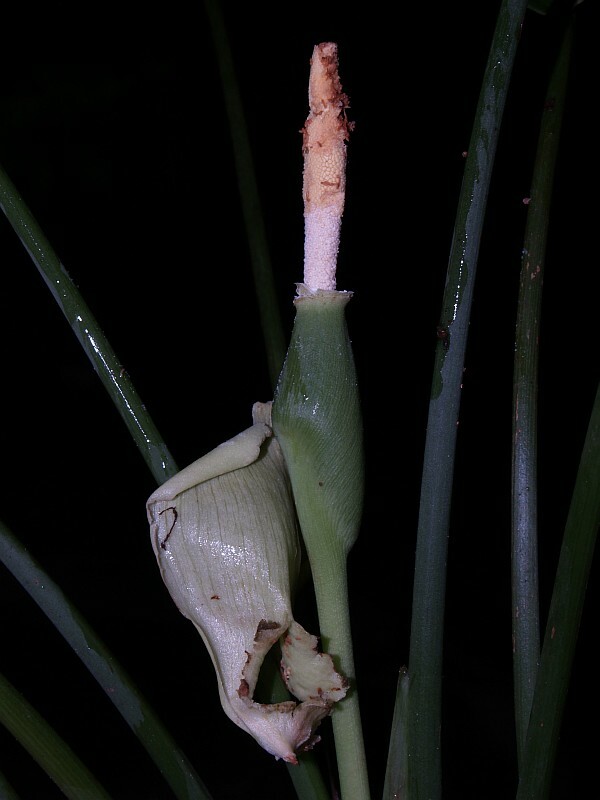 These two species are frequently confused although they are readily separable by inflorescence characters, the most easily observed of which is that the spathe is caducous after anthesis in A. simplex but persistent through to almost full fruit maturity in A. nitidum (Figures 41-42). Figure 41. 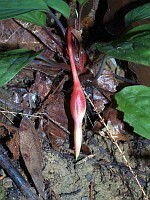 Aglaonema nitidum (Jack) Kunth, note the spathe persistent into fruiting. Figure 42. Aglaonema simplex (Blume) Blume, note the spathe shed during anthesis. Figure 43. Rhaphidophora foraminifera (Engl.) Engl., showing the distinctive perforations adjacent to the midrib. 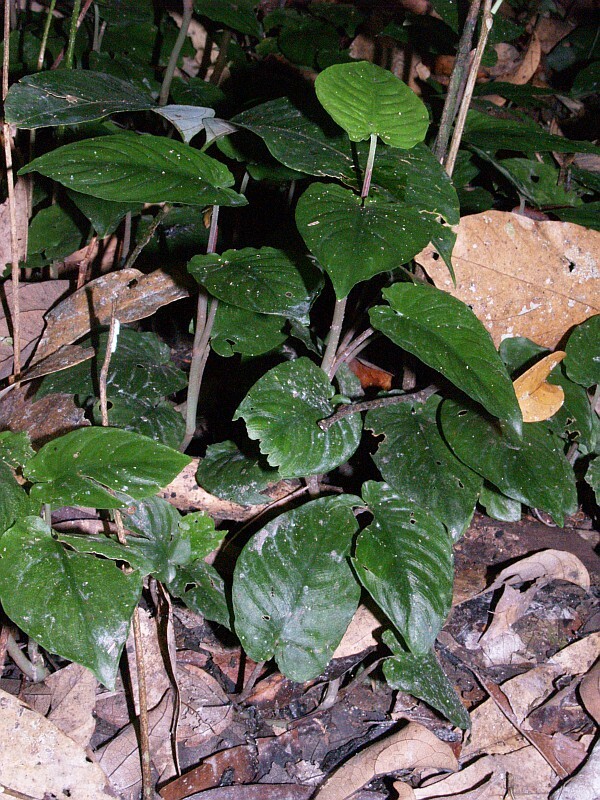 The climbing and hemiepiphytic aroids in Borneo are generally not narrowly endemic, and thus common and widespread species of Rhaphidophora and Scindapsus are found on limestones. Perhaps the commonest species on limestone is Rhaphidophora foraminifera (Engl.) Engl. (Figure 43), which is widespread through the Sunda Shelf, and with its adult leaves conspicuously perforated adjacent to the midrib and the leaf lamina abaxially yellow-pubescent (Figure 44), is readily identifiable. 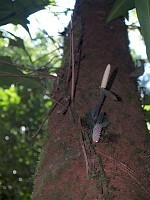 Another common species in the square-stemmed R. elliptica Ridl., most often encountered as a juvenile creeping along the forest floor on the lower parts of tree trunks, but occasionally seen as a many-stemmed hemiepiphyte reaching high into the canopy. 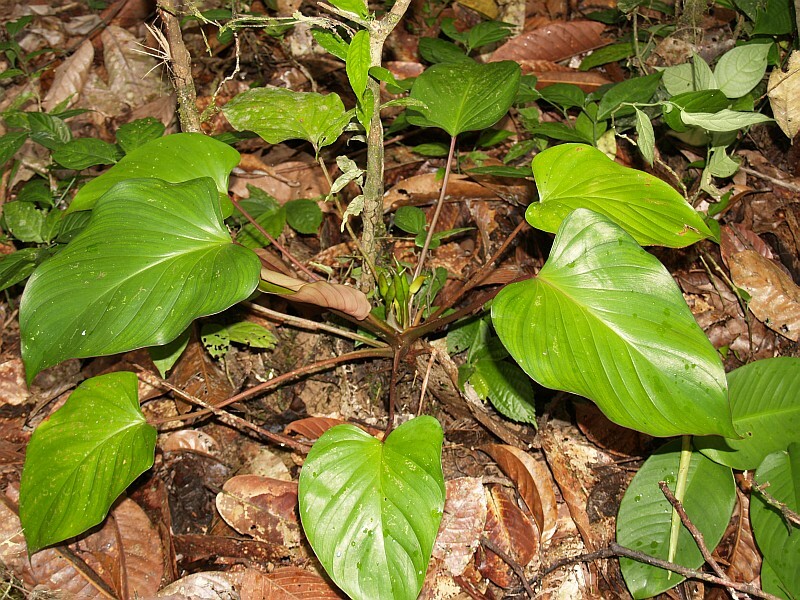 These square-stemmed Rhaphidophora species are still very poorly understood, and it is increasingly likely that there are many species involved but as yet not formally recognized. Although most Rhaphidophora occurring on limestone are widespread species, there is at least one exception, R. tenuis Engl. 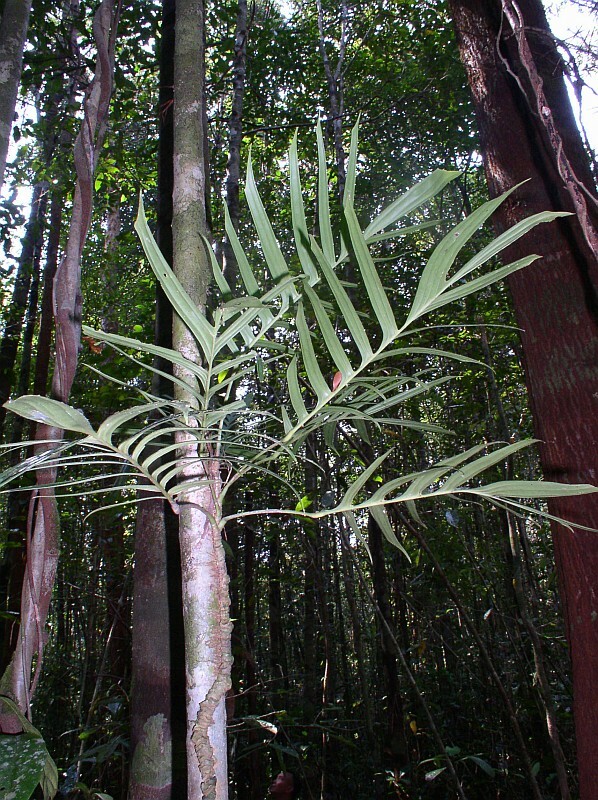 (Figure 45), which while closely related to the most widespread species, R. korthalsii, is a limestone-obligate endemic to Borneo and easily identifiablei from R. korthalsii Schott by the shape of the juvenile shingle-stage leaves, the style of pinnation of the adult leaves, and by the slender spadix (Figures 46-48). 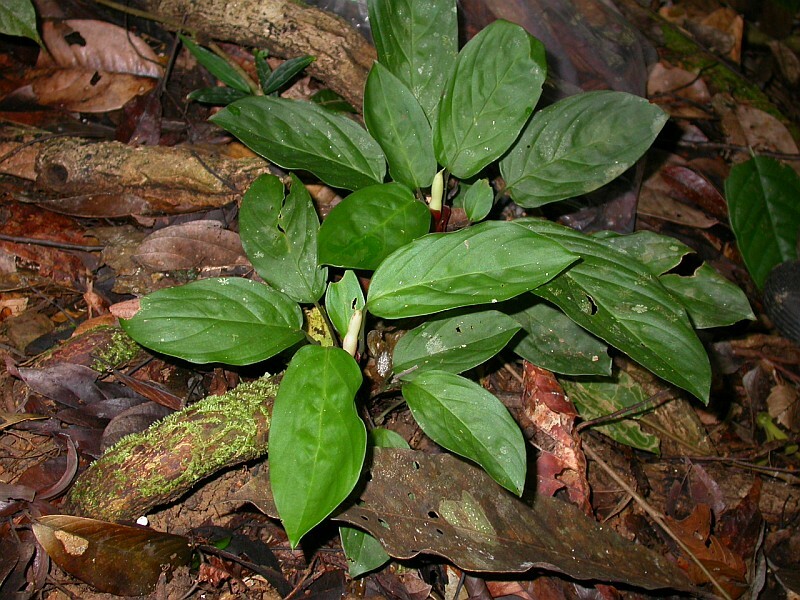 Perhaps the most abundant Scindapsus in Borneo is S. longistipitatus Merr. (Figure 49), closely followed by S. treubii Engl., the latter with the juvenile stage often attractively variegated and the adult stage with markedly oblique leaf laminae (Figure 50). Less often seen on limestone is S. pictus Hassk. 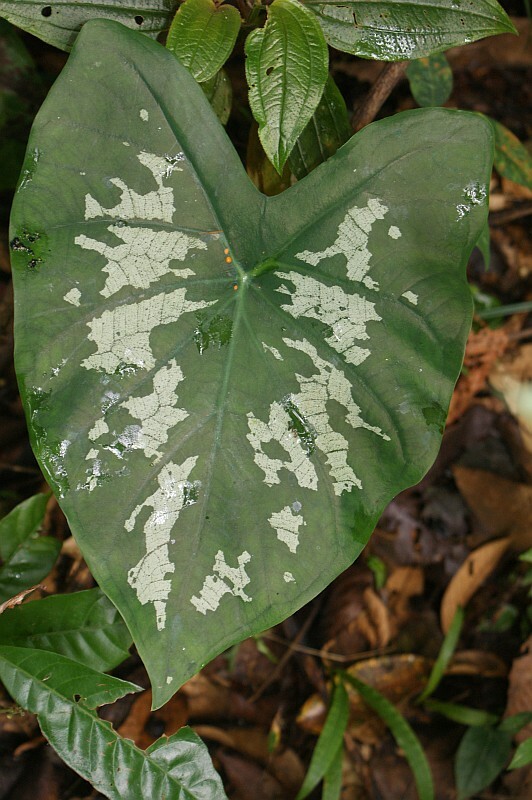 (Figure 51), a species well-established in commercial horticulture and also with often strikingly variegated juvenile plants but, like S. treubii, the adult plants lose their attractive variegation. Figure 44. Rhaphidophora foraminifera (Engl.) Engl., showing the leaf lamina abaxially yellow-pubescent. Figure 45. 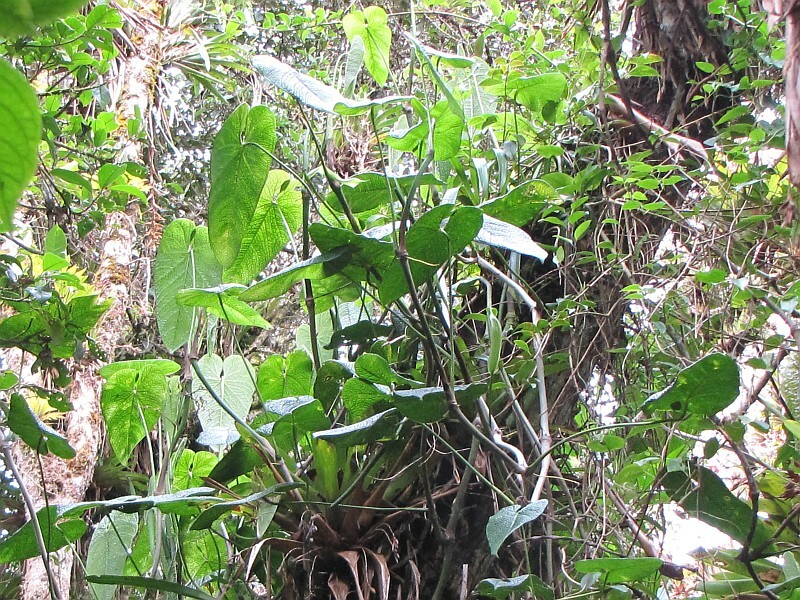 Rhaphidophora tenuis Engl. Figure 46. Rhaphidophora tenuis Engl., juvenile shingle-stage, note the falcate ascending leaves and compare this with the leaves of the juvenile shingle-stage of R. korthalsii Schott in Figure 47. Figure 47. Rhaphidophora korthalsii Schott, shingle-stage, compare this with the juvenile shingle-stage of R. tenuis in Figure 46. Figure 48. Rhaphidophora tenuis Engl., in flower. Figure 49. Scindapsus longistipitatus Merr. Figure 50. Scindapsus treubii Engl., showing the distinctive highly-oblique leaf laminae. Figure 51. 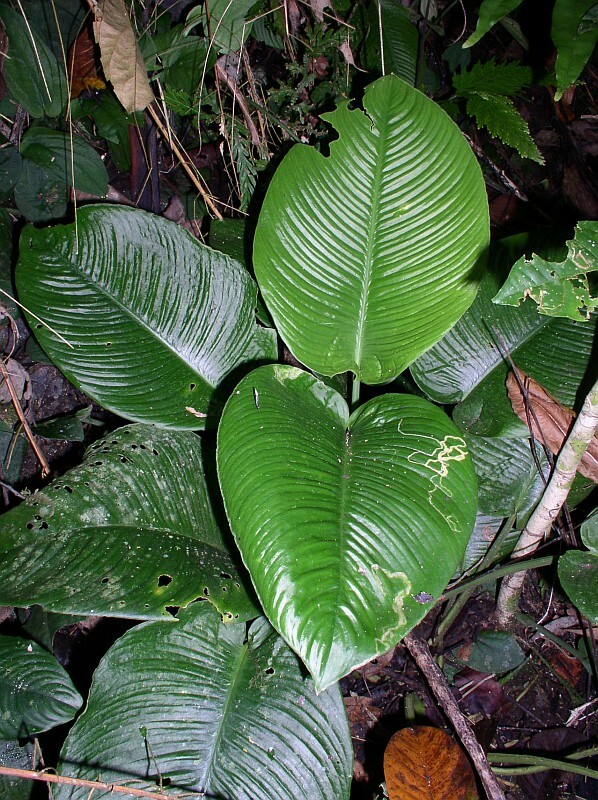 Scindapsus pictus Hassk., one of the numerous leaf colour expressions. Figure 52. Pothos scandens L.
Figure 53. Pothos ovatifolius Engl., juvenile shingle-stage showing the intramarginal veins crossing the primary lateral veins. Figure 54. 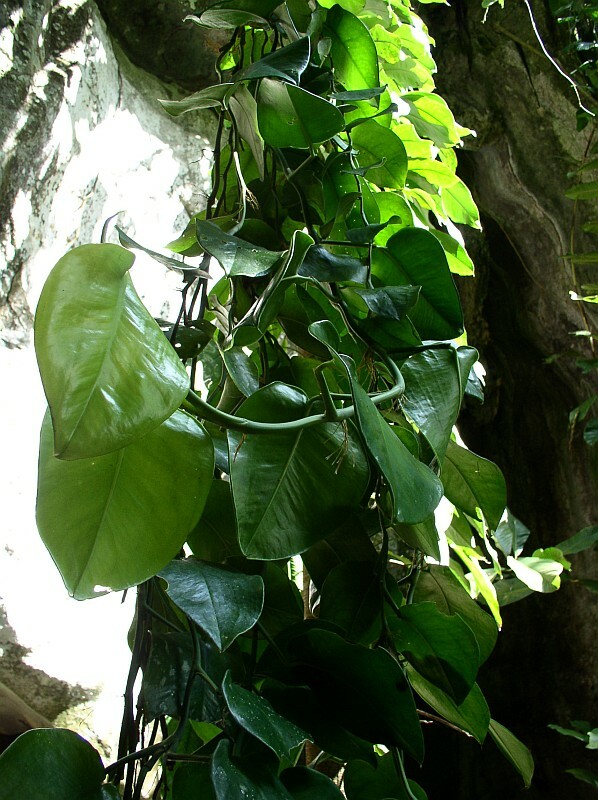 Pothos ovatifolius Engl., adult flowering stems hanging in a curtain from a limestone cave mouth. Figure 55. Pothos ovatifolius Engl., flowering from a shoot tip. Figure 56. Pothos ovatifolius Engl., mature infructescence. Figure 57. 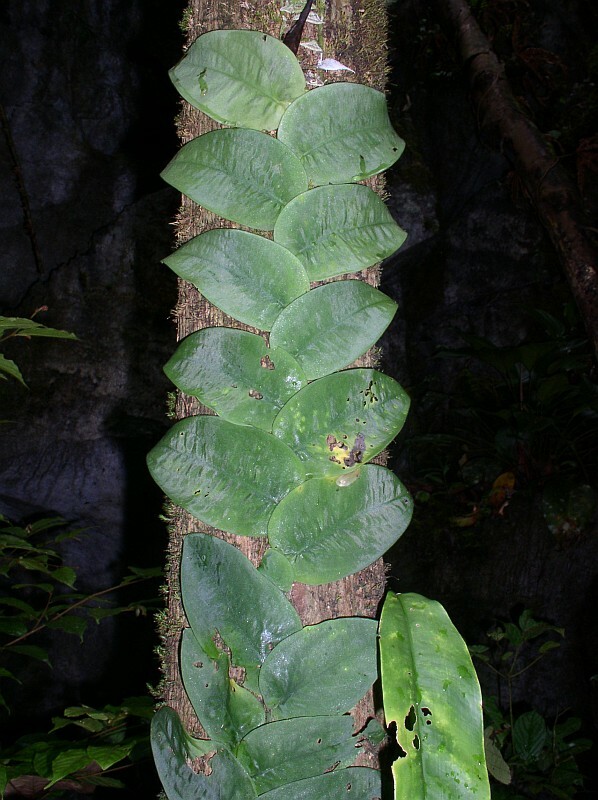 Pothos insignis Engl., climbing specialized flowering shoot. 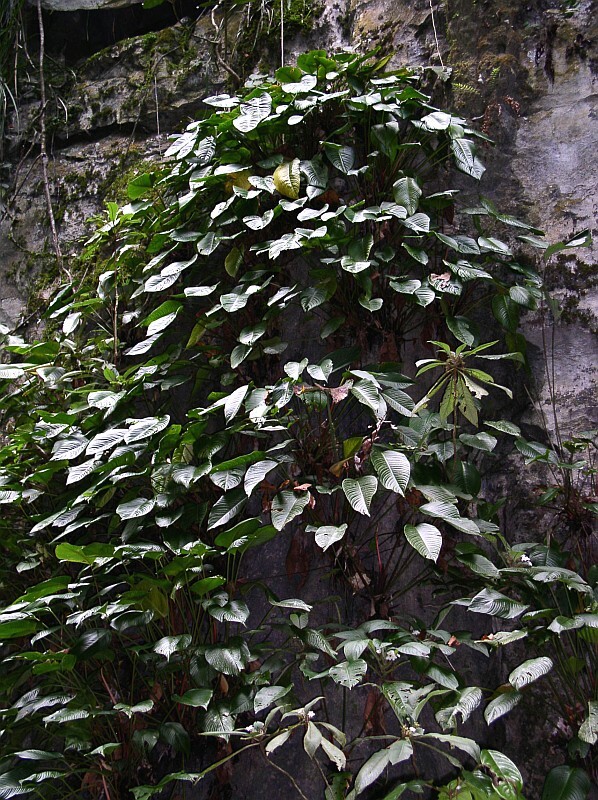 Pothos species on limestone, with the exception of the enormously variable P. scandens L. (Figure 52), tend to be restricted to that particular rock. 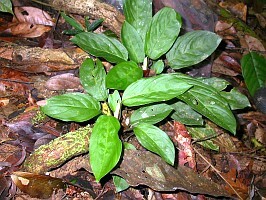 Throughout Sarawak, Pothos ovatifolius Engl. (Figures 53-56) and Pothos insignis Engl. (Figures 57-59) are always encountered wherever limestone is present, even if the limestone is essentially almost completely underground, as on the southeastern flanks of the Bungo Range that divides Bau from Padawan. 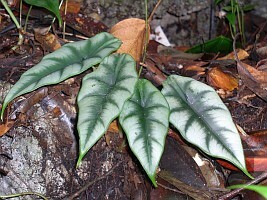 Pothos ovatifolius has a highly distinctive juvenile shingle-stage leaf lamina with the signature three intramarginal veins from the base crossing the primary lateral veins, while adult plants form extensive curtains of pendent stems flowering at the shoot tips, and later large infructescences. 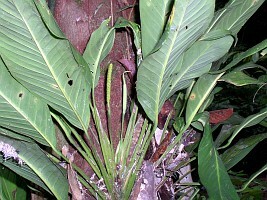 By contrast, P. insignis produces two distinct types of shoot. 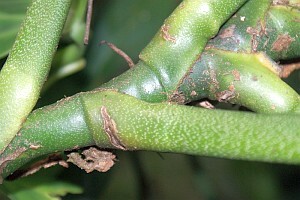 The clinging leaf shoots are sterile but give rise to clinging shoots clothed with large, somewhat inflated prophylls and cataphylls from between which arrive the inflorescences. These fertile clinging shoots can grow to several meters in length, producing a succession of several hundred inflorescences in flushes over a period of many years. Amydrium medium (Zoll. & Moritzi) Nicolson, the only species of this small genus in Borneo, is abundant on limestone as well as on virtually every other geology, and distinctive by the perforated and pinnate leaf lamina and white infructescences (Figures 60-62). 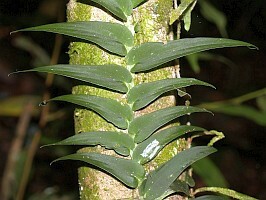 Unlike virtually every other hemiepiphytic monsteroid, A. medium flowers only two or three metres from the ground. 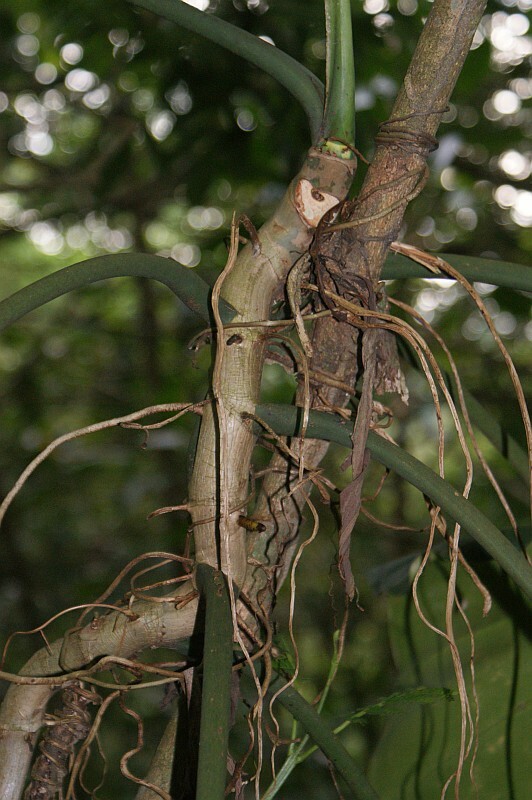 Anadendrum is perhaps the most poorly understood hemiepiphytic genus in Asia. 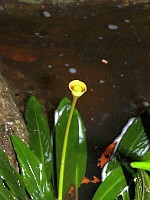 Presently there are only eight published names but in Sarawak alone there appear to be at least 25 species. 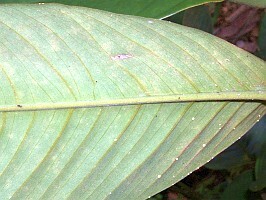 The limestone-associated species in west Sarawak (Figures 63-65) has the abaxial surface of the leaf lamina matte-glaucous grey, appears to be endemic, and is undescribed. 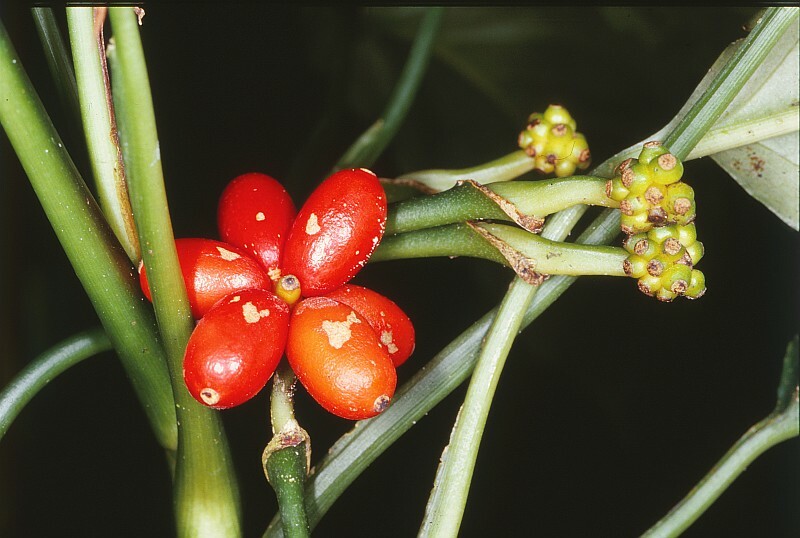 Anadendrum is sometimes confused with Pothos but lacks the veins crossing the primary laterals and has truncate-topped fruits. Figure 58. 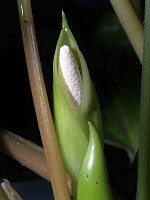 Pothos insignis Engl., inflorescence at male anthesis. Figure 59. 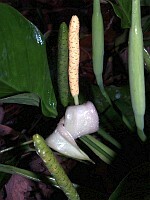 Pothos insignis Engl., mature infructescence. Figure 60. Amydrium medium (Zoll. & Moritzi) Nicolson. Figure 61. Amydrium medium (Zoll. & Moritzi) Nicolson. Figure 62. Amydrium medium (Zoll. & Moritzi) Nicolson. Figure 63. Anadendrum sp., note the leaf lamina glaucous-grey abaxially. Figure 65. Anadendrum sp., the truncate-topped fruits ripening red are diagnostic for the genus. We finish with a word of warning about working on limestone, especially the karst formations. The rocks weather to produce many knife-edge ribs and sink-holes, these often of some considerable depth and lined with more exceedingly sharp erosion ridges. Additionally the rocks are often extraordinarily slippery and so great care should be taken when clambering over such formations, and especially in testing before putting your weight onto a surface that while appearing solid may, in fact, consist only of a thick layer of leaf litter and humus supported on a few rotten fallen branches over a deep sinkhole. We have both acquired spectacular cuts while working on the limestones. Figure 1. Dr. Graf photographing plants. Dr. Alfred B. Graf was born on the 23rd of November 1901 at the Weigelhof (Estate) in the suburbs of Nürnberg (Bavaria/Bayern, Germany) where his father was employed as a manager. On the 14th of December, 2001, Dr. Graf died peacefully in his sleep after a long illness in Düsseldorf (Nordheim-Westfalen, Germany); he was one hundred years old. His family had moved from Nürnberg to Weissenburg (Bayern) when he was a young boy and he spent most of his early years there. He immigrated to the United States from Germany and according to his diary arrived in New York by steamship on March 29, 1925. He immediately went by train to Sutton, Nebraska where he was obligated to work off his passage in exchange for farm labor. However in June, 1998, three years before his death, he returned to Düsseldorf in his native country where his wife, Liselotte (born Vorwerk) owned a home. Liselotte, who had been his lifelong helpmate and frequently traveled with him during his work, died there on the 22 of February, 2005. For most of his life, Graf and Liselotte lived in their house in East Rutherford, New Jersey, but some months of the year they spent in a second home in Vista, California. Dr. Graf had a large library in East Rutherford and in his workroom was a map of the world with a pin dot for every place he had visited. Due to his extensive travels, only a few areas remained uncovered with pins. I visited him once in East Rutherford and stayed overnight in his home. During the first two years he lived in the United States, Dr. Graf lived in Nebraska and afterwards moved to Council Bluffs, Iowa where he started a small nursery and flower shop. However, he was driven out of business by a hail storm that destroyed his greenhouse. At that time, orchid growing was just beginning in the United States. Because he had already learned about tissue culture of orchids in his native Germany, this knowledge was in demand. Dr. Graf took a job at the Julius Roehrs Company, a large commercial nursery in New Jersey, where he spent the rest of his working career. There he became general operations manager for the company’s expanding greenhouse operation and it also became the base for his travels and research. The great interest shown by nursery customers for the company’s retail catalogue was the reason for Dr. Graf to broaden it into a book form. This was first published by him as, “Exotic House Plants Illustrated”, in 1953, with 178 pages and 1,200 illustrations. This book also appeared in several editions with the 10th edition appearing in 1976. The books allowed Dr. Graf to elaborate on the plants he had for sale and he added other pictures from plants he had photographed overseas. This first publication led him to later publish an enlarged book, “Exotic Plant Manual”, with 842 pages and 4,200 photographs, which also was published in several editions. The large book, “Exotica: Pictorial Cyclopedia of Indoor Plants”, (series 1) was published in December 1957. Several editions (all together 12 in four series) appeared and these were further enlarged, ultimately culminating in, “Exotica 4”, a work in two volumes with 2,606 pages and 16,300 photographs. Yet another book, “Tropica”, also went through several editions (fifth edition, 2003), with 1,154 pages (in the last edition) and now 7,000 colored photographs, listed virtually all cultivated plants originated from tropical and subtropical countries, It is still the biggest seller of Graf’s books. His last big book, “Hortica: Color Cyclopedia of Garden Flora in all Climates and Exotic Plants Indoors”, was published in 1992. It has 1,218 pages with 8,100 color photographs. All of these books were published over the years by the Julius Roehrs Company. Whereas the “Exotica” books contain mainly black and white photographs and only a few color plates, “Tropica” and “Hortica” are in full color. When Dr. Graf attempted to publish his first book, “Exotica”, and had approached commercial publishers, they thought it would be a risky venture for them to print the work. It was then that the Julius Roehrs Company decided to publish Graf’s books on their own and all of his publications became huge successes and with excellent and profitable sales. Dr. Graf was a world authority on cultivated tropical and subtropical plants and was well known to gardeners, plant lovers and botanists all over the world. The pictorial cyclopedias of plants were of regular use by plant lovers who could determine their plants using photographs and find a key to their cultivation. As a globe-trotting botanist, plant hunter and collector, as well as a photographer, Dr. Graf searched throughout vast regions and remote islands. 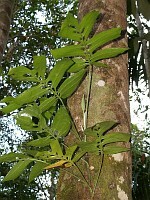 He visited the giant Lobelia on Mount Kilimanjaro in Africa, the Rhododendron in Sikkim (India) and the bamboos of China. He also brought back plants from his journeys. 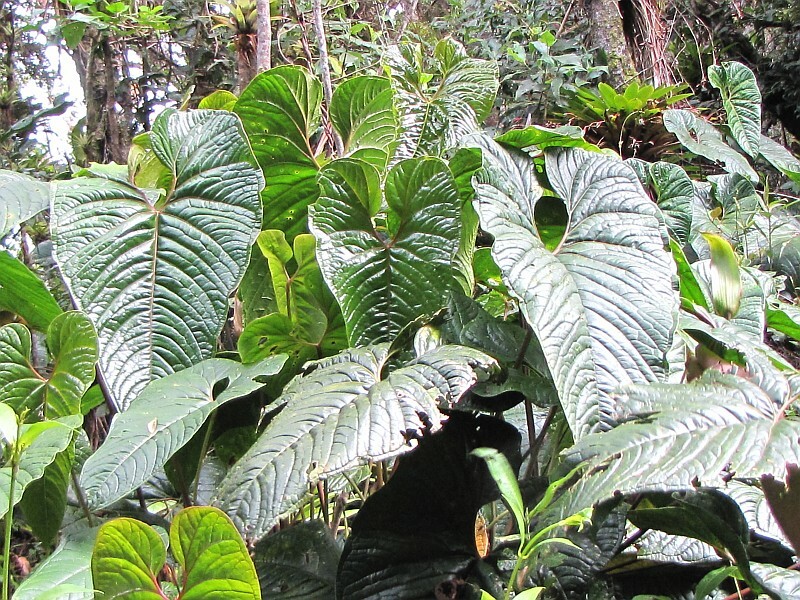 One of the most spectacular plants he introduced into cultivation was the Begonia exotica from New Guinea (it is correctly named Begonia brevirimosa Imsher today.) His travels also resulted in many plant photographs which were stored in his extensive archive. 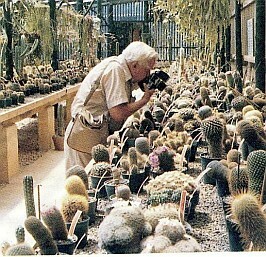 He was also in contact with many botanists and plant specialists around the world. When Alfred Graf came to Germany, he usually visited me at the Botanical Garden of München where I was employed for 33 years. We had long discussions about tropical and subtropical plants. Over the years, I sent him photographs of plants which we cultivated in our garden. Quite a number of them are included in his books. His correspondence to me was always in German and was broken only in his last years when he could not write any longer. By this time Dr. Graf’s declining eyesight made him totally blind and it was difficult for him to get around. 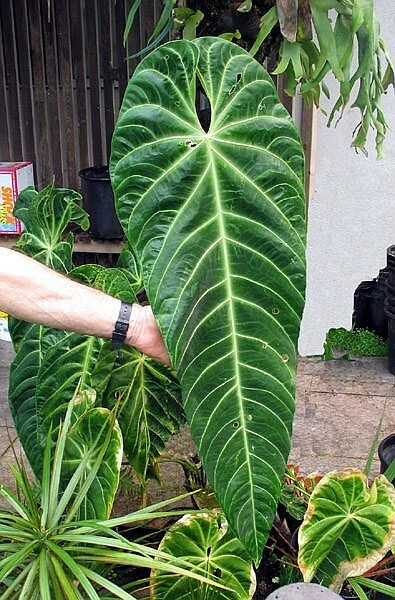 The few remaining years prior to his death were tragic, especially since it was impossible for him to see the plants which were his life time’s work. Just a few months (since September, 2001) before his death, full time care was arranged for him and his wife who also grew less able to care for him. In 1962, when he traveled for 8 months through Africa, he caught an illness which was never diagnosed, even with the best doctors of tropical medicine in New York. The best they could do was to attempt to control the fever. The end result was damage to the retinas of both of his eyes. Even though he had made an incredible recovery, he had blank spots in his vision and much later he developed glaucoma and macular degeneration which probably was due to this earlier damage. 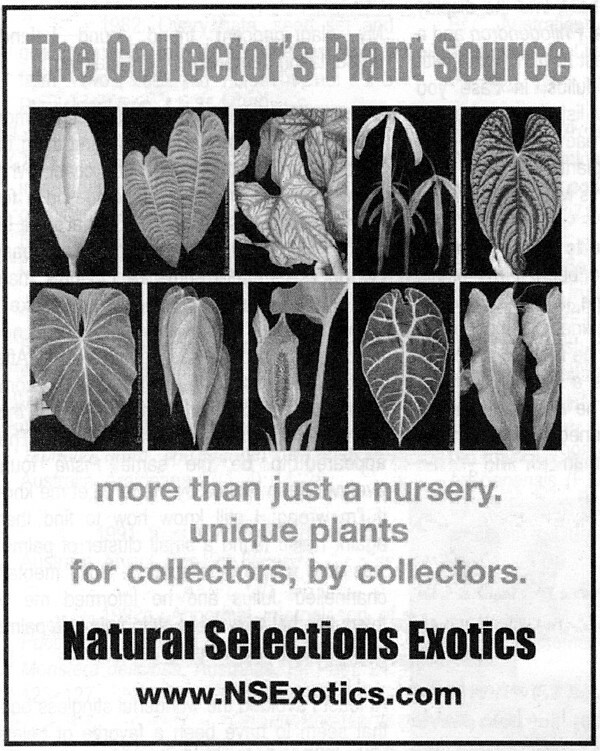 “Exotica 4”, one of Albert Graf’s popular selling plant books, alone contains 1,248 aroids, many other plant families (813 Begoniaceae, 816 bromeliads, 1,021 cacti, 622 ferns, 533 gesneriads, 296 palms, 1,439 orchids and many others). 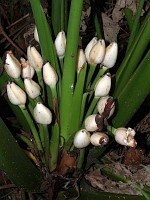 The aroids are the second largest group of plants following the orchids. 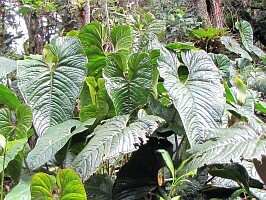 In addition to plant descriptions, a number of general chapters are included, such as how to care for plants indoors with a key to cultivation, hydroculture, gardening in warm climates, interior plantscaping, methods of propagation, insect and disease control, characteristics of plant families, botanical terms, pronunciation of Latinized plant names, history and origins of exotic plants, climate and vegetation maps, plant geography and habitats, and color charts used in horticulture and bibliography. There was also a “Synopsis of Revisions and Updates” in the 1985 edition. 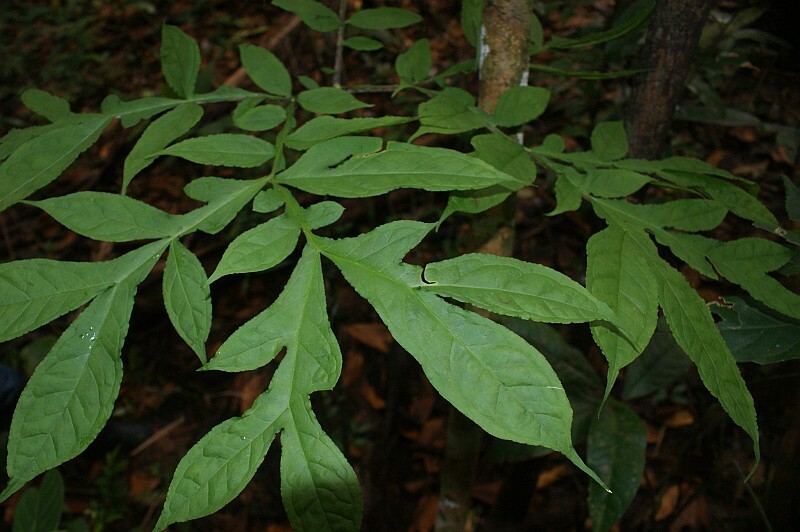 Dr. Graf was always very careful to get the correct name of a plant which was not so easy in many cases where plants were grown under a synonym or a completely wrong name. I would like very much to thank Dr. Graf’s daughter, Doris Graf Matthews of Vista California , for information about her father for this obituary. My thanks also go to Jean Ruff from the Julius Roehrs Company in Farmingdale , New Jersey . Information was also obtained from his obituary in the New York Times. The International Aroid Society has long had a strong cell of membership in California, and recently, local enthusiasts have once more organized to form the West Coast Chapter of the IAS. This effort was capably led by former IAS president, Dan Levin, and Director of the UC Botanic Garden at Berkeley, Dr. Paul Licht. The meeting was well attended by members and enthusiasts from all over California, including some who had traveled from the Central Valley and Southern California. Figure 1. Attendees examine plants for sale. 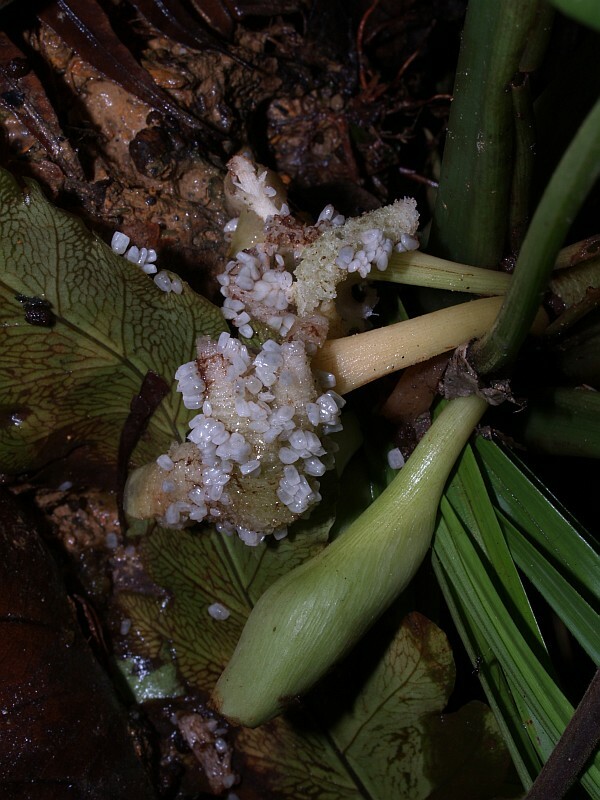 Aside from the many popular tropical Aroids, a surprisingly large number of Aroids are adapted to growing outdoors in our Mediterranean climate of California. 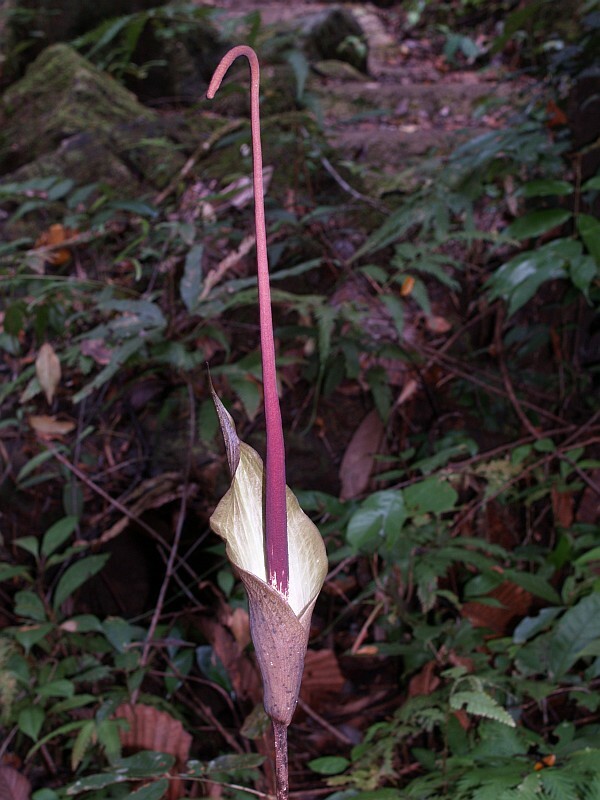 From Arisaema (Jack-in-the-Pulpit) to Zantedeschia (calla lilies), there's something in the Aroid family for everyone on the west coast. The west coast is also home to enthusiastic greenhouse growers like Bill Weaver, who has now brought both Amorphophallus gigas and Amorphophallus titanum into flower in his San Francisco Bay Area back yard. 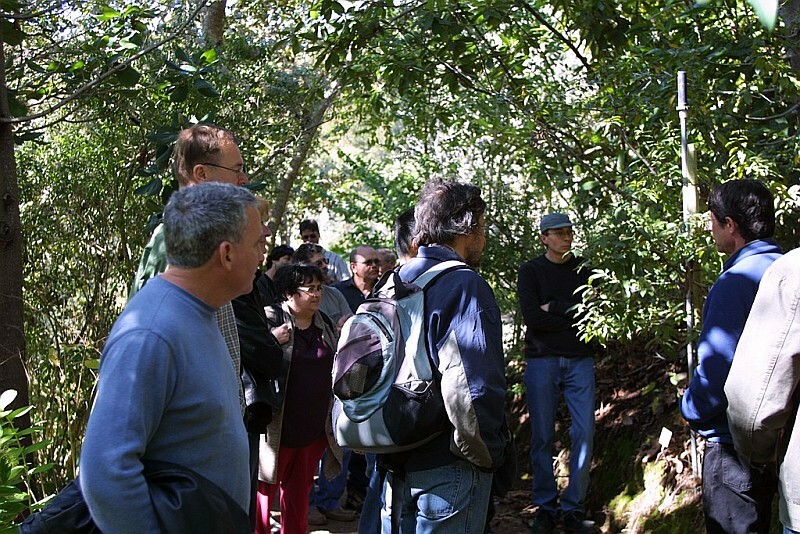 The inaugural meeting was held on March 8th, 2009, at the UC Botanical Garden at Berkeley where choice plants were offered for sale and attendees were treated to a behind-the-scenes tour of the greenhouses. Figure 2. 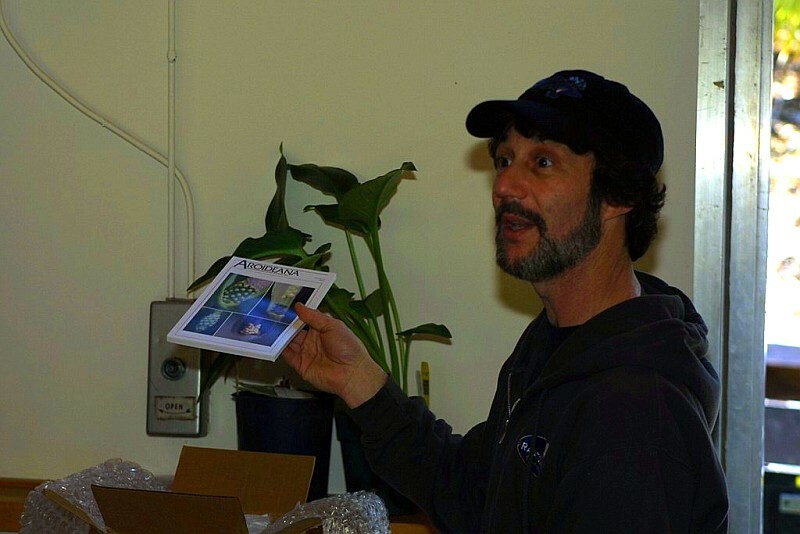 Dan Levin explains the many virtues of owning a full set of Aroideana. Large numbers of rare plants were made available for sale by several members who brought in trays from their own collections. These were supplemented by plants from the UCBG greenhouses and collection. Plant offerings included several rare varieties of Amorphophallus, including A. titanum seedlings from a recent flowering at the garden. 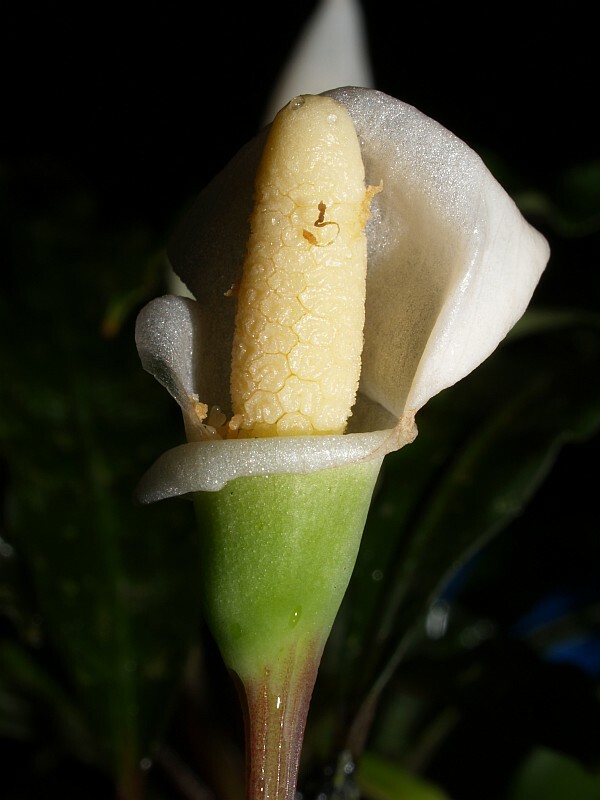 Dr. Christopher Rogers brought in some Helicodiceros muscivorus (Dead Horse Arum) which turned out to be very popular. 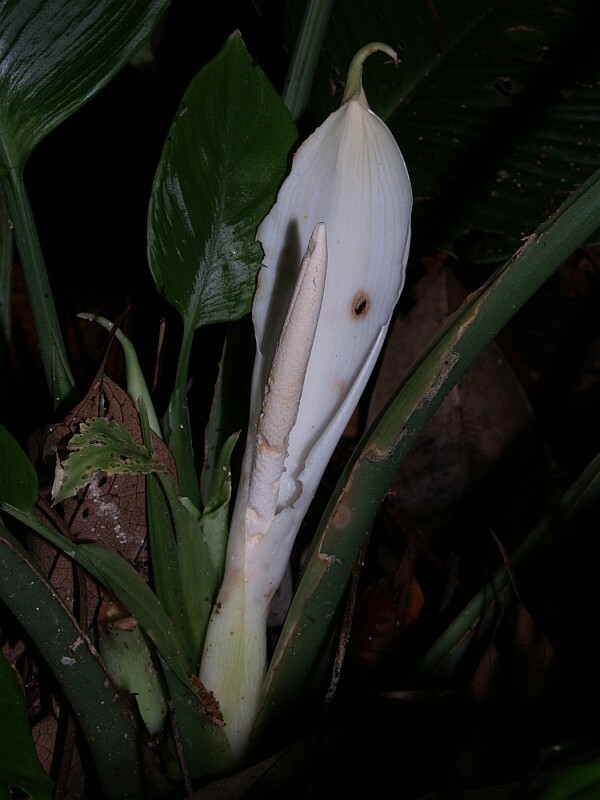 Several large specimens of the fragrant calla lily, Zantedeschia odorata, many different Arisaema, several species of Arum, and many more genera were also on offer. All plants were donated to the garden before the sale, and all benefits from the sale went to support the garden. Figure 3. 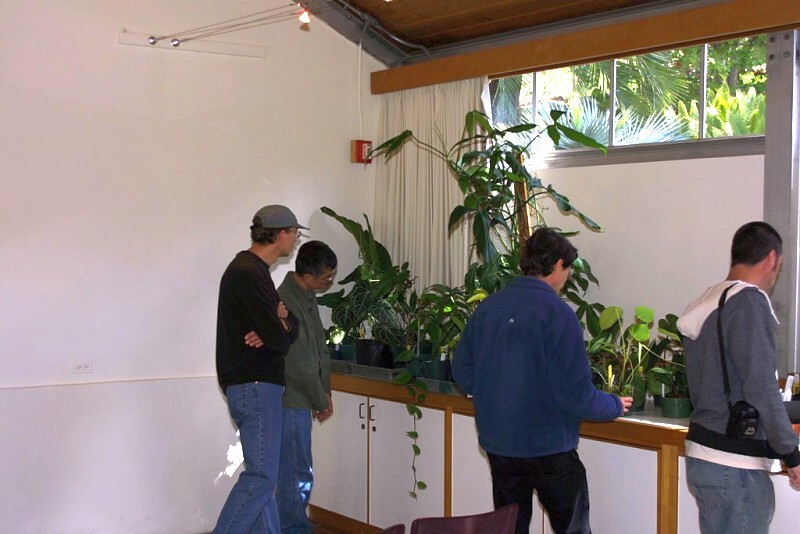 Attendees view a Philodendron experimentally planted outdoors in the garden. After light refreshments, attendees were welcomed and some of the plants which had been brought in were described by their growers. Fred Dortort, a long time volunteer at the garden who may be known to some IAS members, described plants selected from the Garden’s collection. Shortly following, Associate Director of Collections and Horticulture, Dr. Christopher Carmichael, led the group on a short tour of the Aroid collections, including a visit to a large research greenhouse which is normally off limits to the public. Figure 4. 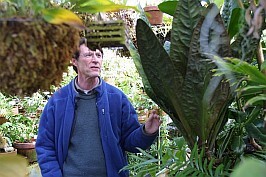 Fred Dortort shows off a specimen of Anthurium superbum in the research greenhouses. The next meeting is planned to be held October 18th at the botanical conservatory of the University of California at Davis. Future meetings will move around the state, though the instigators are primarily Northern California based so far. Interested parties can stay up to date by visiting the local website at www.aroid.org/westcoast/ and contacting Dan Levin (levin@pixar.com) to be put on the e-mail list. Meetings will be about twice a year, and no dues are charged. I have just returned from a short trip to South America, primarily to attend the Vth Colombian Botanical Garden in Pasto. This weeklong meeting enabled me to meet with many of my old Colombian botanical friends and visit the area around Lago Guamuez. 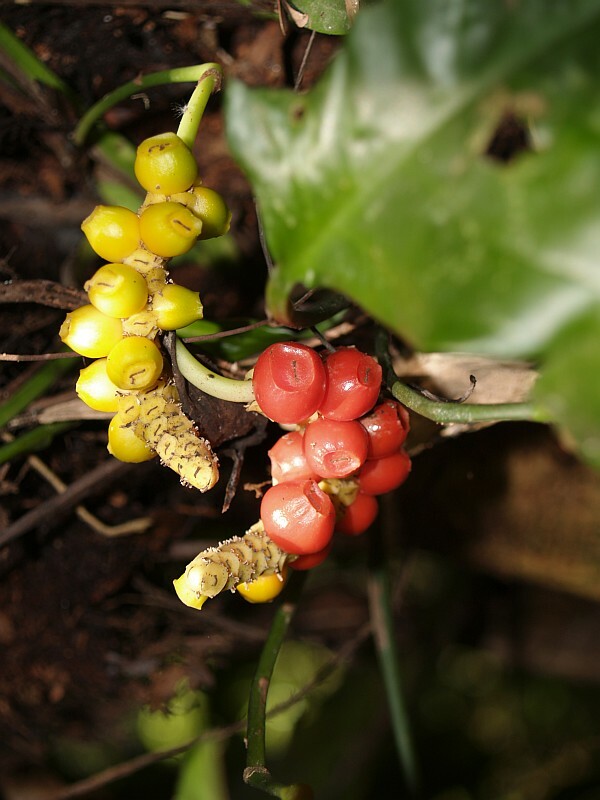 All along the road between Pasto and the lake we saw a common Anthurium section Belolonchium (Figs. 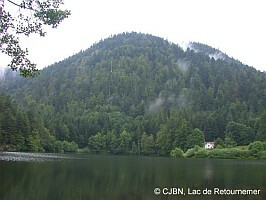 1–3) which resembles A. bogotense and the same species was common on Isla Corota, in the middle of Lago Guamuez at 2830 m elevation. 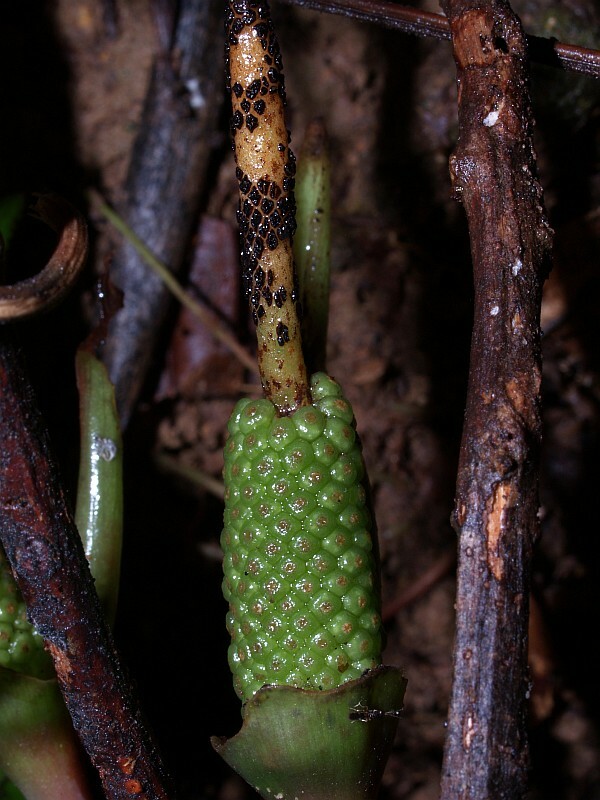 A second, much less common species, very close to A. corrugatum, probably a member of Anthurium section Polyneurium (Fig. 4) was apparently the only other species on the island. 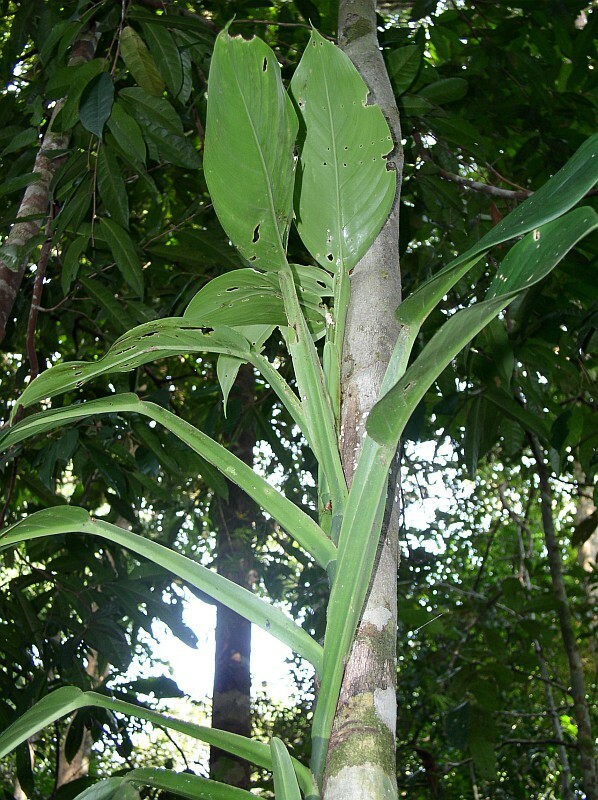 It was a hemiepiphytic plant with long internodes, long-petiolate leaves and narrowly ovate-bullate blades. 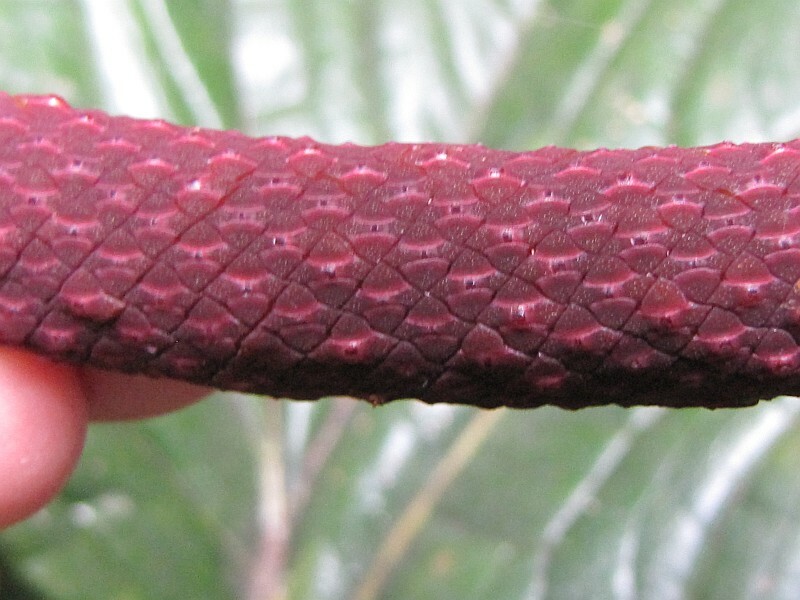 It seems most likely to be related to Anthurium corrugatum Sodiro or A. rugulosum Sodiro but differs in having much longer internodes. I suspect it may be a new species. Figure 1. Anthurium cf. bogotense Schott, habit. Figure 2. Anthurium cf. bogotense Schott, habit. Figure 3. Anthurium cf. bogotense Schott, habit. Figure 4. 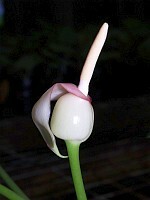 Anthurium cf. 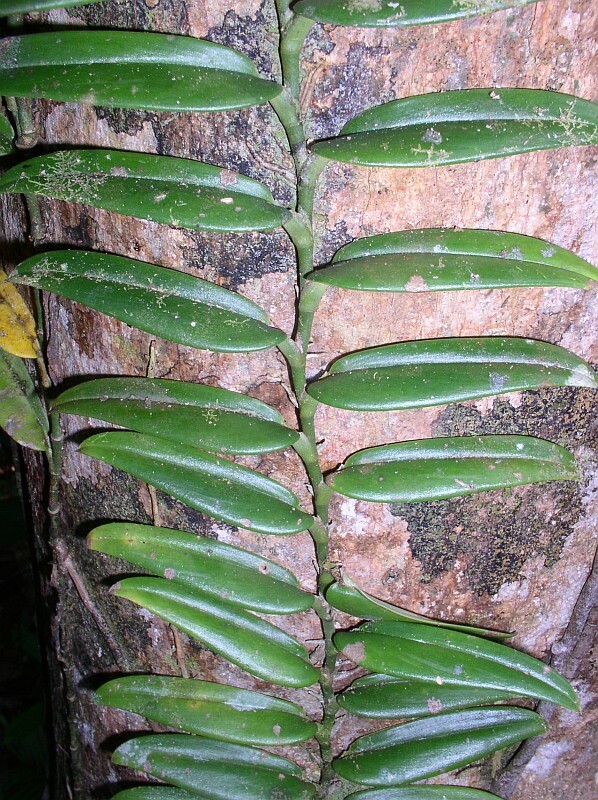 corrugatum Sodiro. Figure 5. 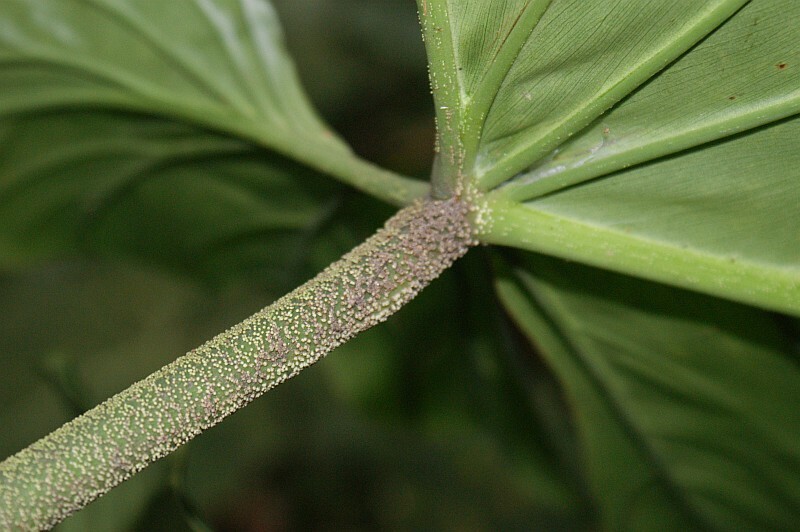 Anthurium cf. 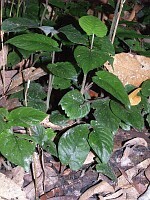 marmoratum Sodiro. Figure 6. 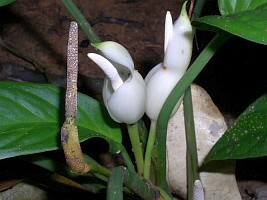 Anthurium cf. marmoratum Sodiro. Figure 7. The dining table at Rancho Vanguardia. After the Pasto Conference, I traveled to Ipiales and on to Ecuador where I spent some time working at the Herbario Nacional (QCNE) pulling a loan of undetermined material then I returned to Colombia by bus and took another bus to Cali in Valle Department. In Cali I rented a car and went to the Cordillera Occidental. The first area I visited was the region of San Antonio near the Continental Divide west of Cali. It is a residential area located along a short road that leads to a microwave tower located along the Continental Divide. 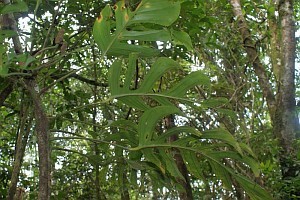 With the exception of the areas devoted to the homes, most of the region is virgin cloud forest. 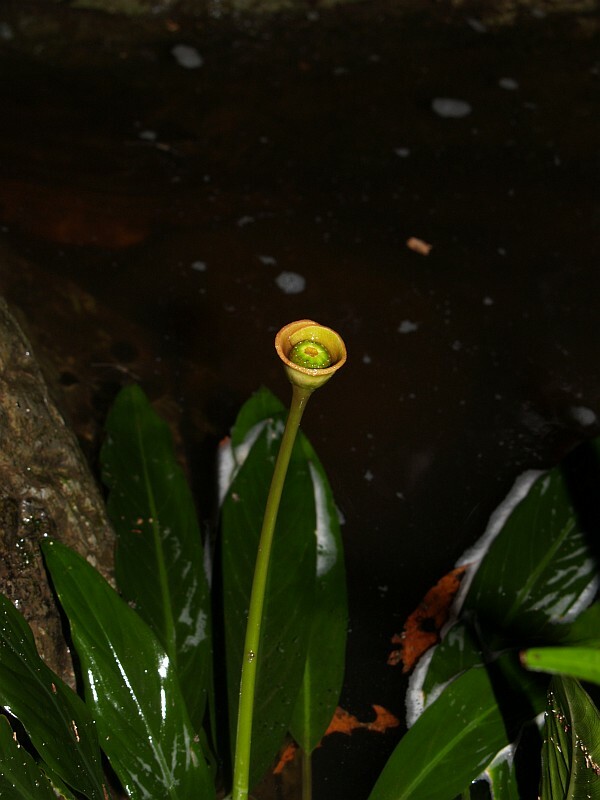 Among the species seen there were Anthurium nigrescens Engl., Anthurium pulverulentum Sodiro, A. recavum Croat, several species of Anthurium section Calomystrium, Chlorospatha noramurphyae Croat & L. Hannon, and Philodendron sp. nov.
Later in the day I drove over the Divide and took the turn-off to the old road to Buenaventura stopping in Queremal. In Queremal there is now a new hotel, the Hotel Campanerio, located along the main road just where it heads downward toward Anchicaya. 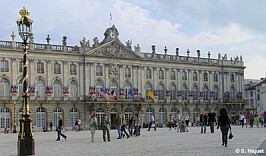 It is a nice place with large and modern rooms. 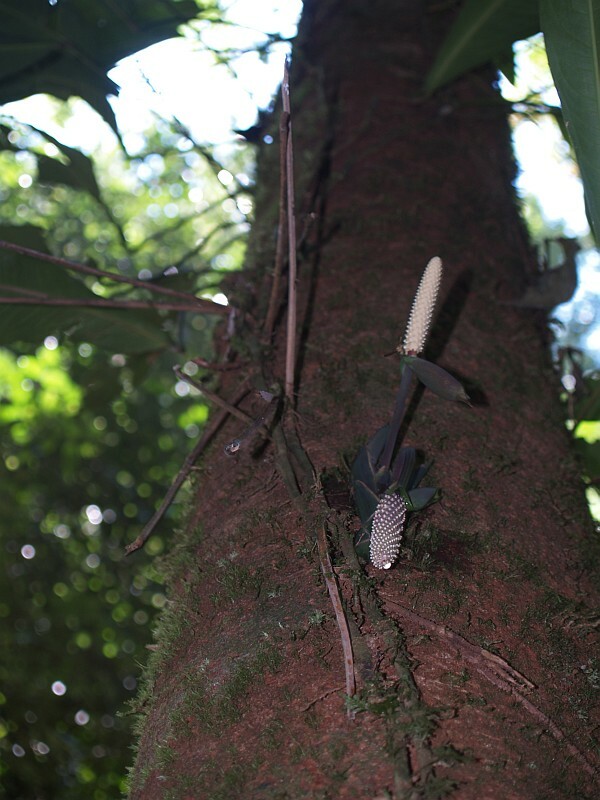 That same day I collected below Queremal, finding two very different members of Anthurium section Cardiolonchium. One, occurring mostly above 1430 m has blades about ca. 2.3 times longer than wide and has the major veins on the upper surface conspicuously paler with the collective veins essentially lacking since all of the primary lateral veins merge with the margin. 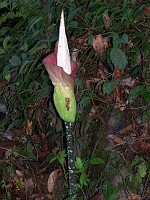 I believe that this species is the same as that being grown by Mardy Darian under the name Anthurium cf. marmoratum (Figs. 5–6). The other species, occurring between 700–1430 m is characterized by having blades 1.3-1.5 times longer than wide, having the major veins less conspicuously paler on the upper surface and by having the collective veins arising from one of the lower basal veins. 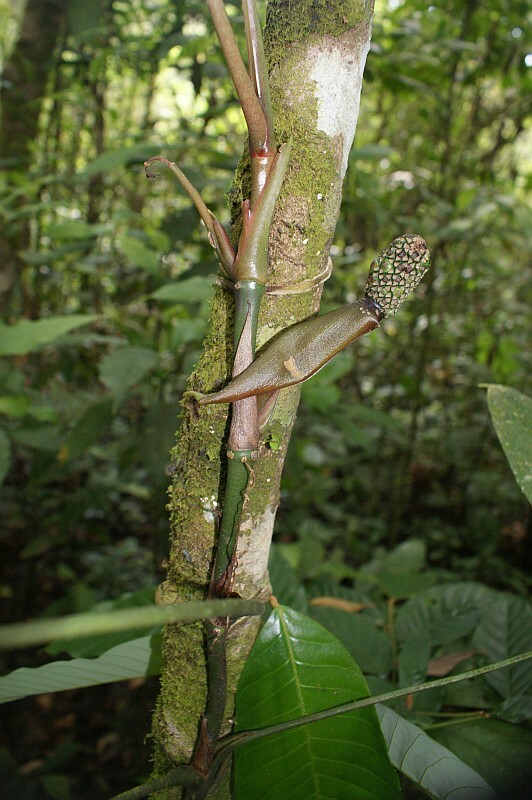 Another interesting species found in this region was one that I had also seen on my last trip to the nursery of Eduardo Calderon not so far away along the main Cali-Buenaventura Road. 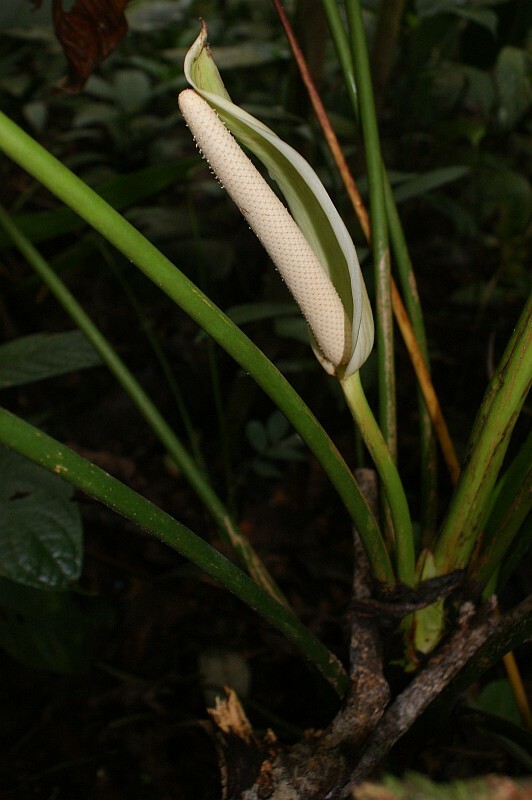 The species resembles Anthurium panduriforme Schott but seems to be a new species. 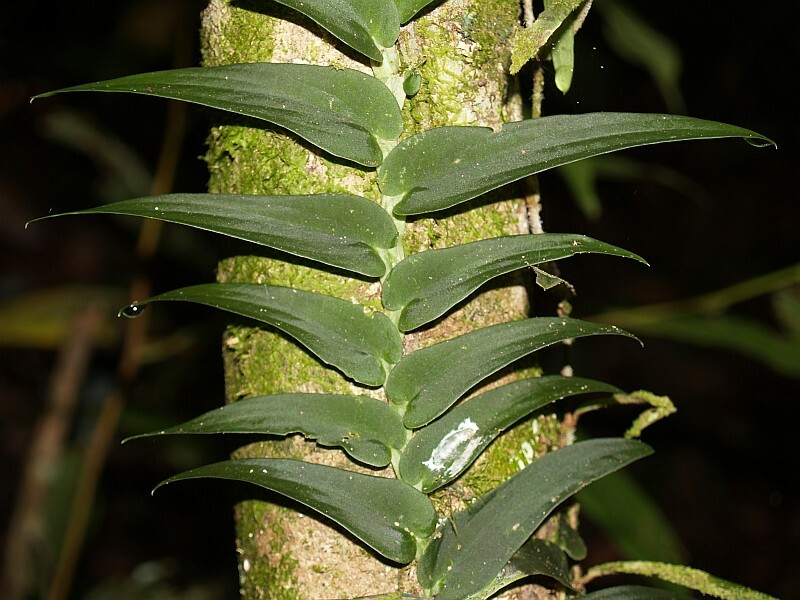 Yet another species believed to be new is one closely related to A. recavum but one that has a larger, longer, more narrowly triangular blade and a broader spathe. Other species seen in the region were Anthurium jesusii Croat, A. peltigerum Sodiro, A. urbanii Sodiro and Philodendron cf. sparreosum sp. nov.
My next stop was Tulua, another city in Valle Department located a little more than an hour north of Cali. I had returned the rental car and took a bus to Tulua where I was met by Alejandro Castaño, the Curator of the Herbarium TULV, who took me to the Jardin Botánico Juan Maria Cespedes.The garden is located about 10 km out in the country in an area of tropical moist forest but there is an adequate supply of water and they have a rather good selection of palms and many trees with medicinal or ethnobotanical value. I had not been to the herbarium for about 10 years and found a lot of the material in the collection that I was able to determine. I finished in the herbarium by about 11:00 PM that night and spent the rest of the night in their dormitory. At 6:30 AM my driver arrived in his battered 35-year old Willys Jeep and took me back into Tulua to the bus terminal. Even though my next stop was Armenia and it would have been closer to go there directly from Tulua, I had to return to Cali because when I returned the rental car on Friday it had been a national holiday and I was unable to settle up my bill completely. With the rental car contract fully completed, I took a bus to Armenia. Once there I took another bus to Calarcá where I was met by Andrea Ortega, the Director of the Jardin Botanico de Quidio. 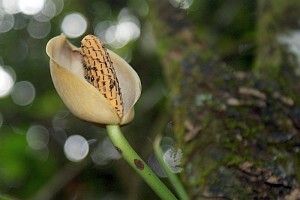 I had met Andrea in Pasto and she encouraged me to come to Calcará to determine their collections of Araceae. Andrea and some of her staff took me on a tour of the living collections. 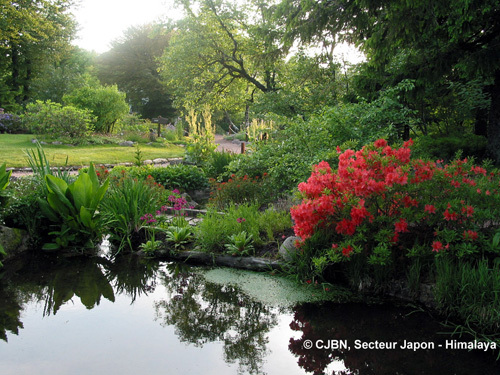 The garden which consists of 15 hectares, was founded in 1979 and has a wide array of different trails leading into interesting and diverse terrain. 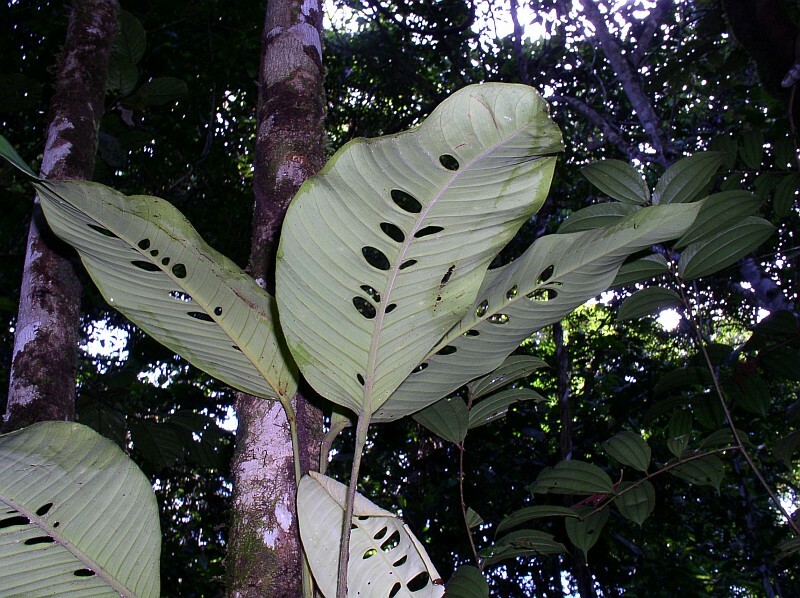 Part of the garden is remnant of virgin forest and this forest is relatively rich in Araceae. 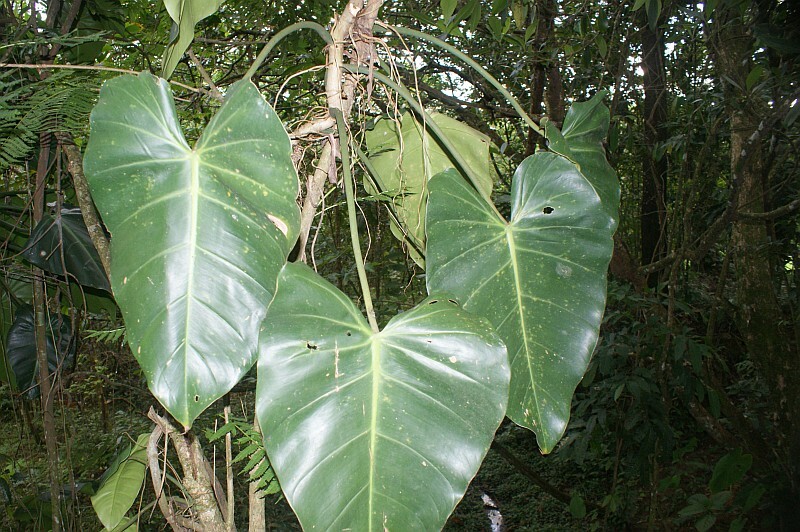 Found in this forest was a species of Monstera and three species of Philodendron subgen. Pteromischum. 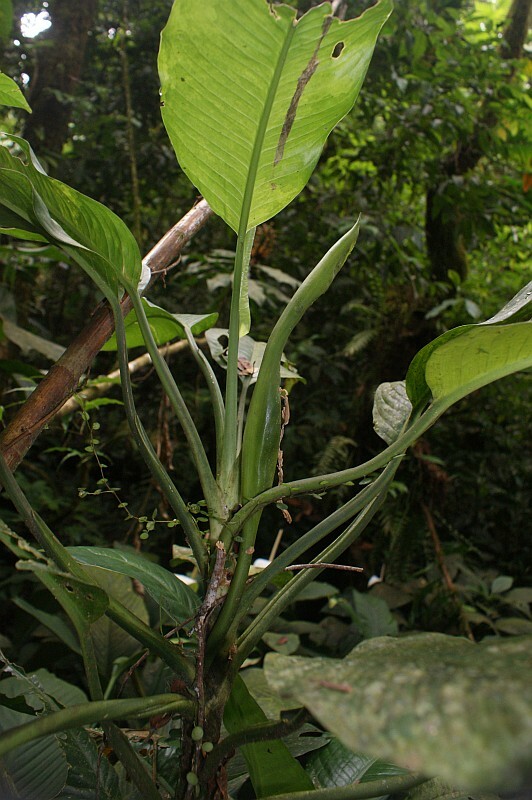 A large Anthurium section Cardiolonchium was common there and a large Belolonchium, believed to be A. salgarense Croat was cultivated there as well but the gardeners were not certain that the species was native to the region. That evening I slept in the guest quarters within the garden and pressed and described the collection that I collected that day in the botanical garden. The next morning I visited the Mariposaria (Butterfly House) and learned of the ways they collect, breed and grow a great many species of butterflies. 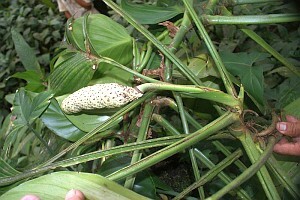 I also took a tour of the garden, collected more Araceae and prepared and described more specimens. Then I was driven to the town of Calcará and boarded a bus to Bogotá. The bus arrived in Bogotá late in the afternoon. Then I took a taxi to Natalia Castaño’s apartment. That evening Natalia and I discovered that the Chlorospatha that Natalia had collected at Río Blanco near Manizales in Caldas Department during the course of her undergraduate thesis work proved to be a new species. The next day I worked at the National Herbarium and spent the following night at the home of Julio Betancur, a botanist at the Herbario Nacional. 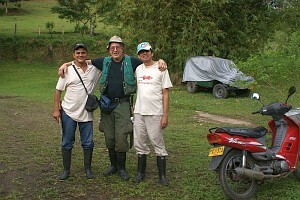 The following day I took a bus to Villavicencio and was met by Mario Caicedo and Francisco Castro. Mario, with whom I have corresponded for the past several years after he began sending me images of Araceae in this area, is a medical doctor who lives in a ranch house about 5 km north of Villavicencio. Francisco, whom I was not familiar with previously, turned out to be a fountain of information on the area. He is an agronomist as well as an all around naturalist who is writing a book on the Natural History of the Orinoco Drainage in Colombia. He has thousands of pictures of plants and animals including insects, amphibians and even fishes from this area. We spent the remainder of the day together going through the images of the Araceae he had in his computer, working at a large table near the kitchen in front of a large photo of the llanos with a group of horses (Fig. 7). The huge and sprawling ranch house was divided into a fancier part and a more functional area where the kitchen is located. The latter was at least in part where ranch hands lived. The building was once the headquarters of a 25,000-acre cattle ranch and most of the décor revolved around this theme. 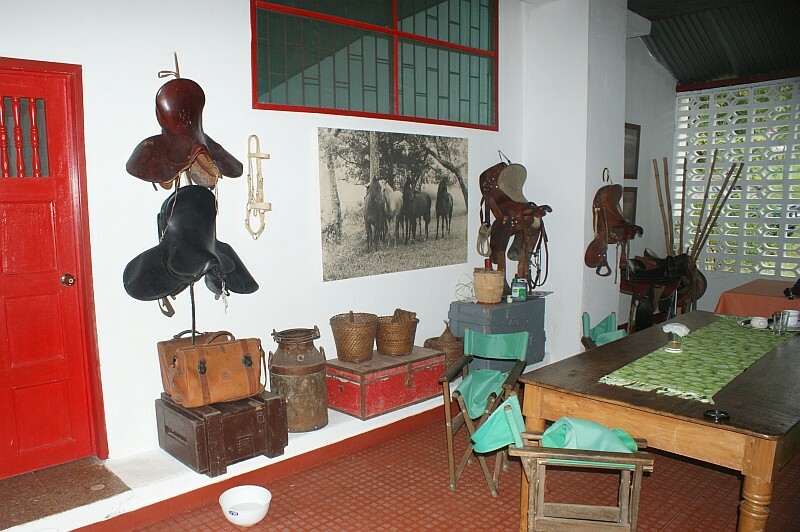 There were many saddles, bridles, even branding irons neatly arranged in displays along the walls. Though Mario lives alone in this big complex and uses some rooms for his medical practice, the place seemed alive with visitors-- a cousin from Medellín, a friend from Bogotá and a gentleman who frequently shared meals with us who was working in the oil-fields south of Villavicencio on what he said was a 20-10 schedule (twenty days on and 10 days off). The cook kept us supplied with an ample supply of tintos and limonadas as we worked. My assigned room was in the fancier part of the house that was separated from the remainder by a broad patio, partly covered with a roof. There was a gigantic dining room equipped with a fancy long table and nice chairs as well as two bedrooms in that part of the building. Francisco spent the night and slept in one of those rooms, too. Figure 8. Francisco Castro, Tom Croat & Mario Caicedo. Figure 9. 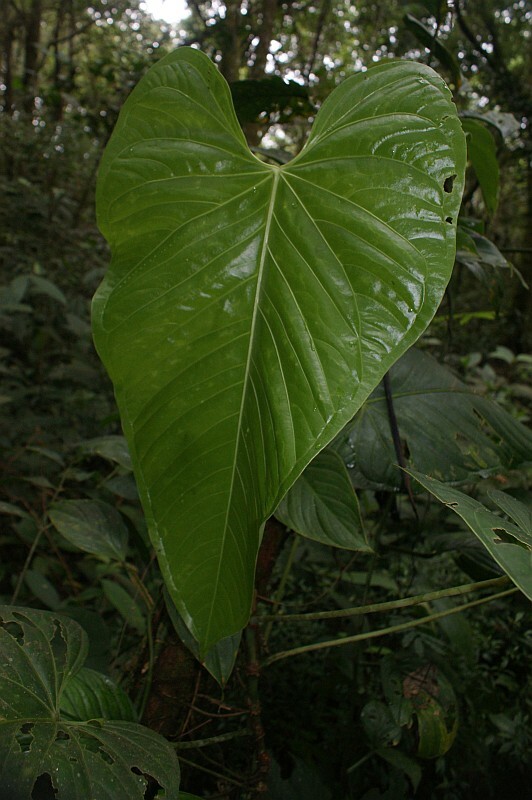 Philodendron sp. nov., Croat 101264. Figure 10. 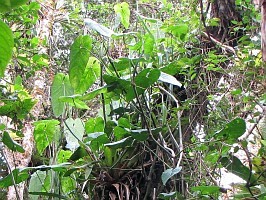 Philodendron sp. nov., Croat 101264. Figure 11. 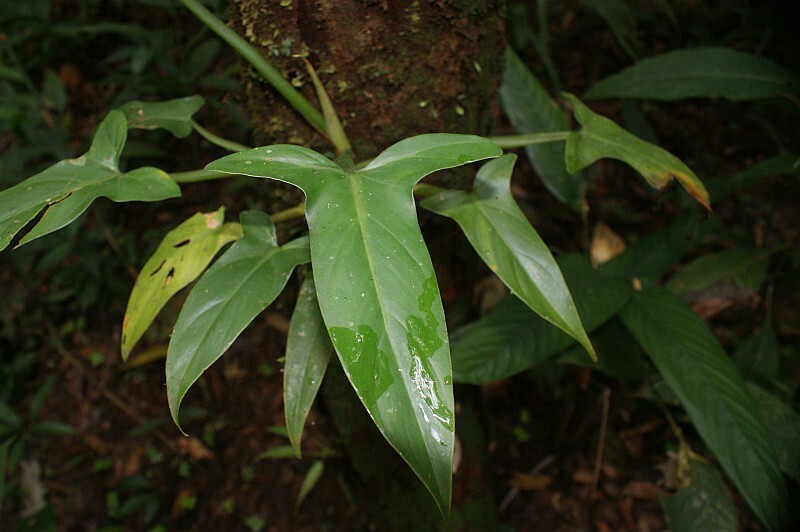 Philodendron sp. nov., Croat 101264. Figure 12. 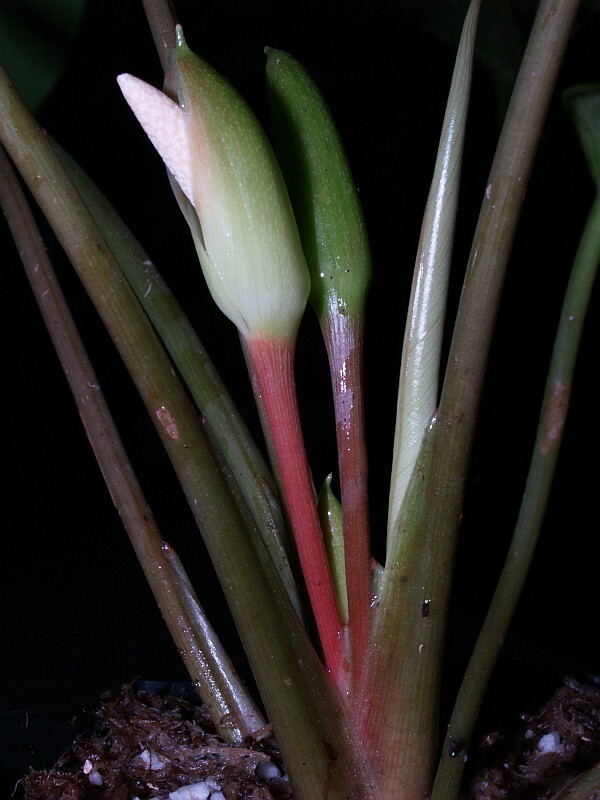 Philodendron sp. nov., Croat 101264. Figure 13. 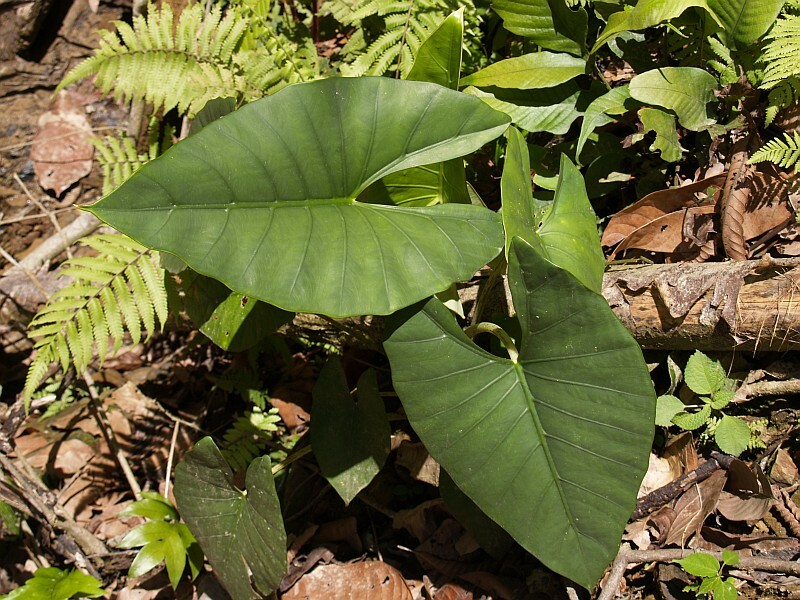 Philodendron sp. nov., in flower,Croat 101264. Figure 14. 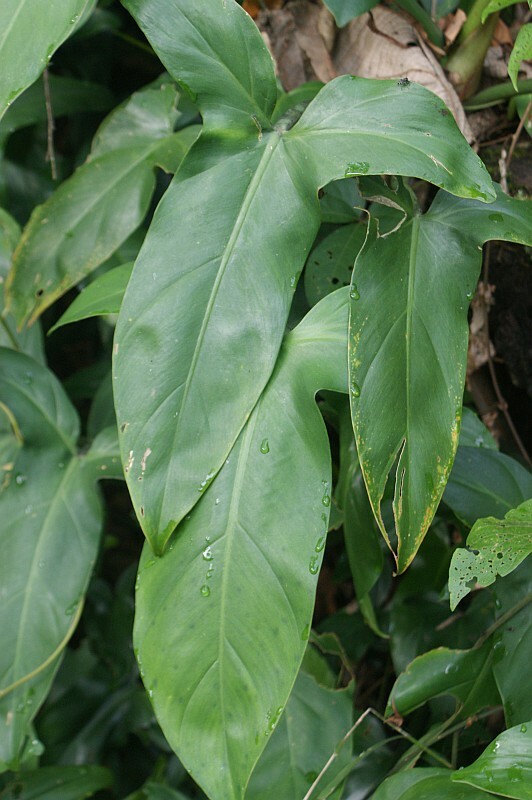 Philodendron gloriosum André, Croat 101263. Figure 15. 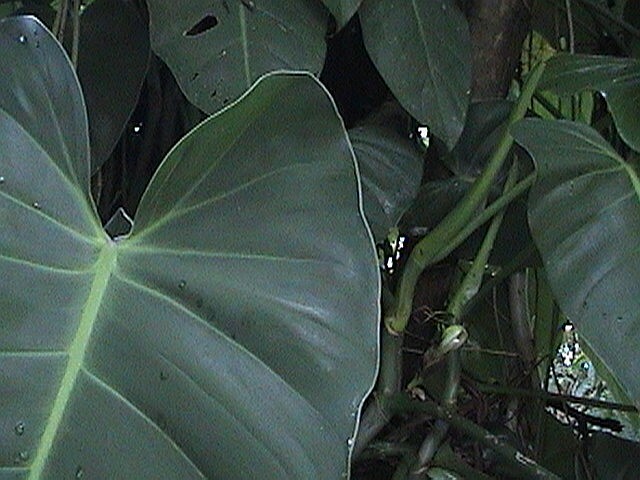 Philodendron gloriosum André Croat 101263. Figure 16. 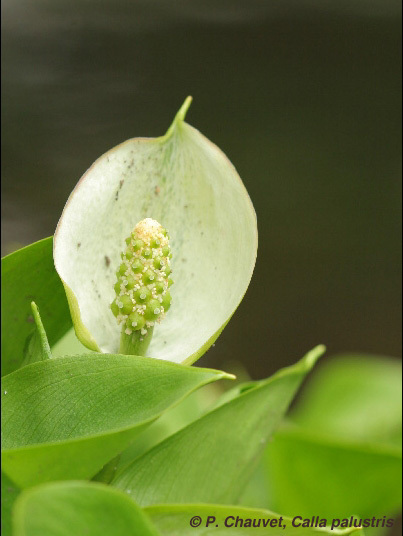 Anthurium breviscapum Poepp., Croat 101256. Figure 17. 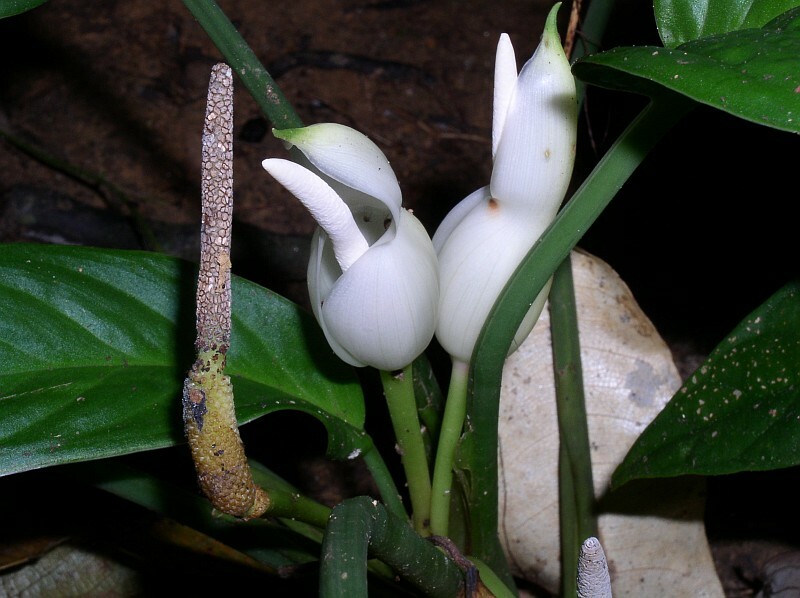 Anthurium breviscapum Poepp., Croat 101256. The following morning we set off on foot to explore the forest near the ranch house (Fig. 8). 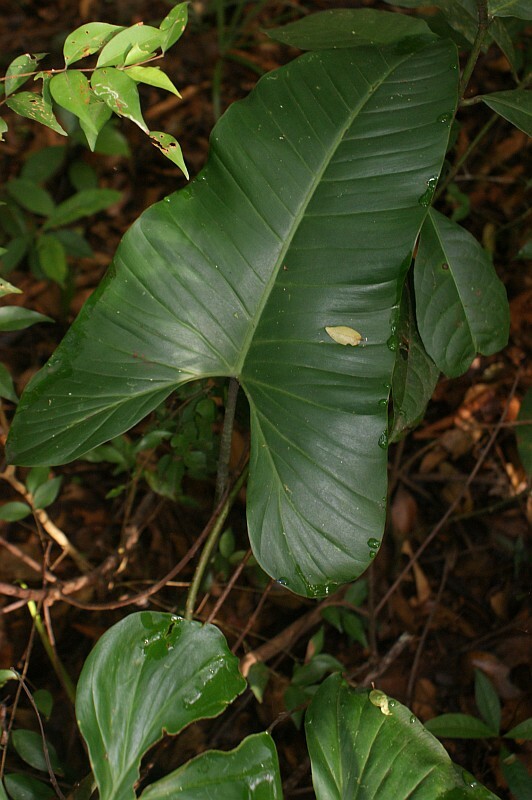 We immediately found what appears to be a new species of Philodendron at the edge of the yard, something that I found shocking in light of the fact that the Amazon lowlands are relatively well known (Figs. 9–12, Croat 101264). 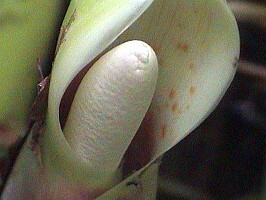 The plant was sterile but Mario had previously sent me an image of the flowering plant (Fig. 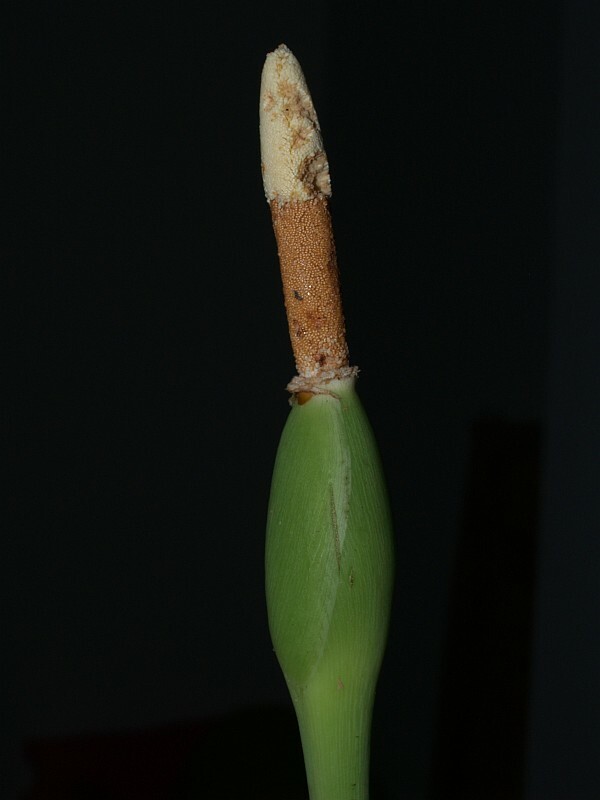 13, Croat 101264) and promised to collect and pickle inflorescences the next time it flowered. 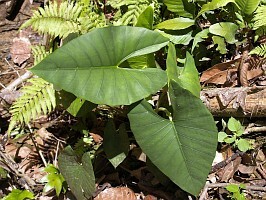 It was also there at the edge of the yard that I saw the first population of Philodendron gloriosum André (Figs. 14–15, Croat 101263) and it was startling to see something that I only hoped to find. 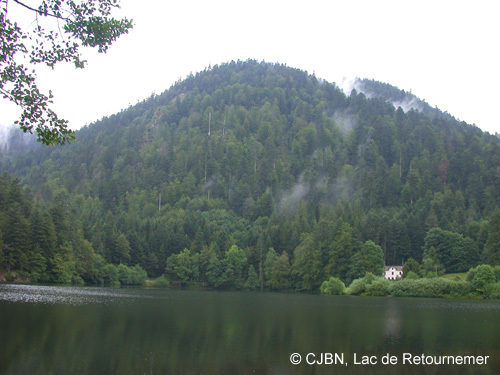 The French botanist, Eduard André, once worked in this same region, collecting and describing P. gloriosum André. I imagined André actually walking along this same stream over a hundred years earlier. 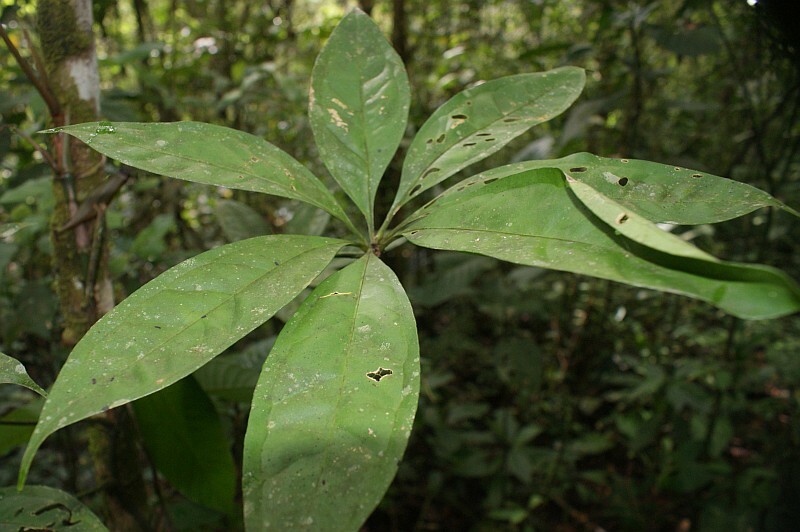 This species is now widespread in cultivation as the result of living material that he took back to Europe but it is not apparently so widespread in the Amazon lowland because not a single collection of it existed in the herbarium at the Universidad de los Llanos which I later visited. 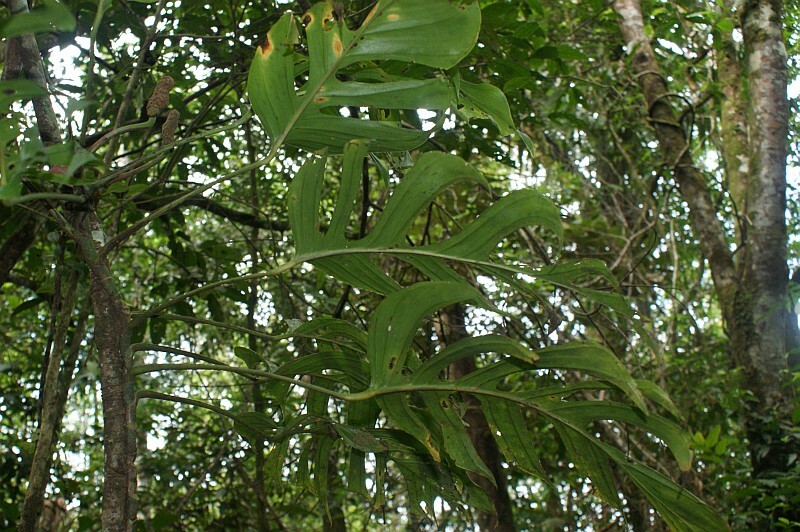 Since the species had not been recollected since André’s original collection, I had believed that the species might even be extinct in the wild so I was pleasantly surprised to see that it was very abundant in the area, occurring in large stands, especially along the lower edge of road banks and near streams. Figure 18. 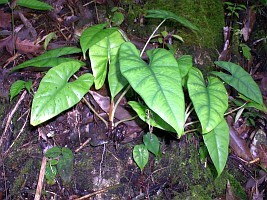 Anthurium pentaphyllum (Aubl.) G. Don. var. 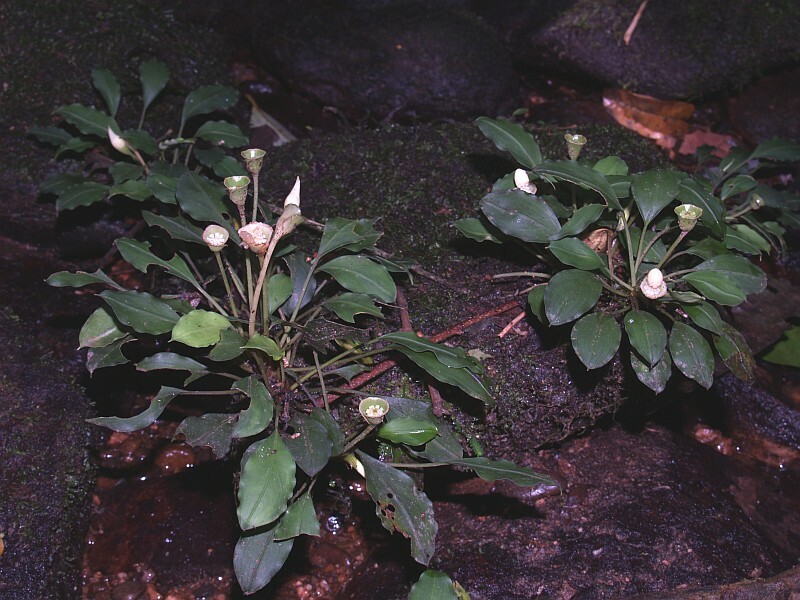 pentaphyllum, Croat 101257. Figure 19. 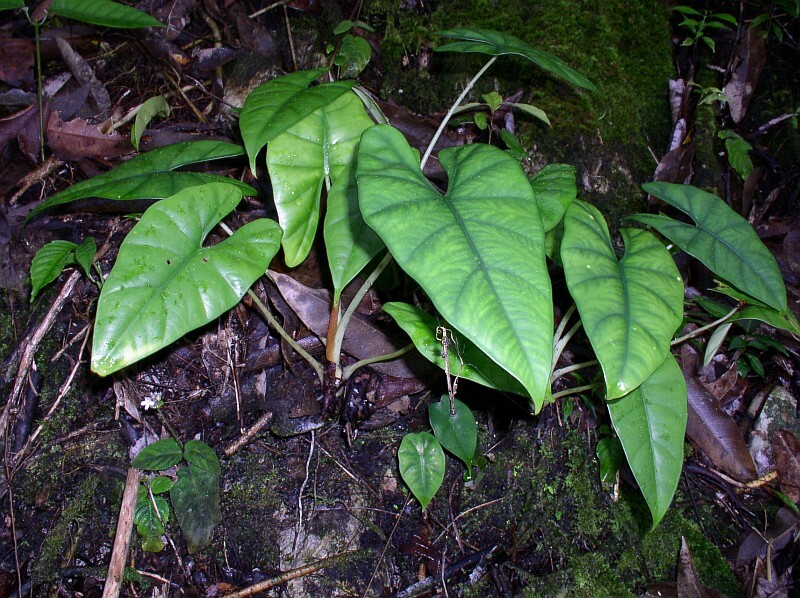 Anthurium pentaphyllum (Aubl.) G. Don. var. pentaphyllum, Croat 101257. Figure 20. Anthurium formosum Schott, Croat 101266. Figure 21. 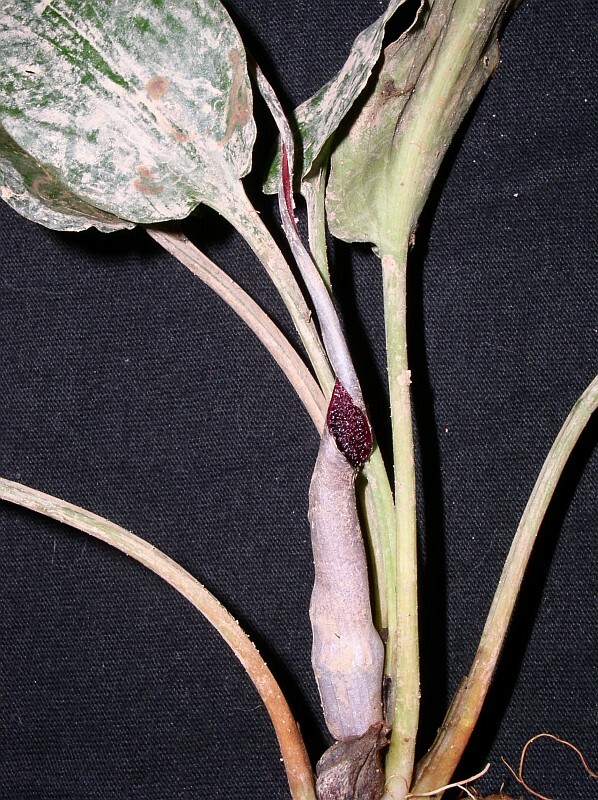 Anthurium formosum Schott, Croat 101266. Figure 22. 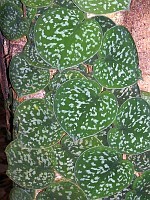 Caladium or Xanthosoma, Croat 101261. Figure 23. 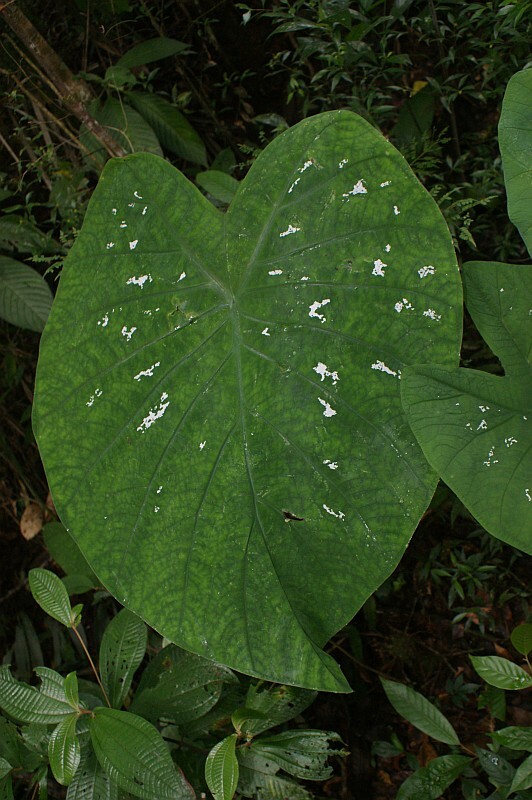 Caladium or Xanthosoma, Croat 101261. Figure 24. 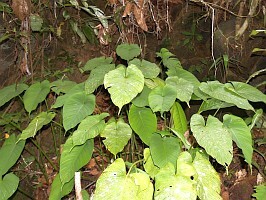 Caladium or Xanthosoma, Croat 101261. Figure 25. 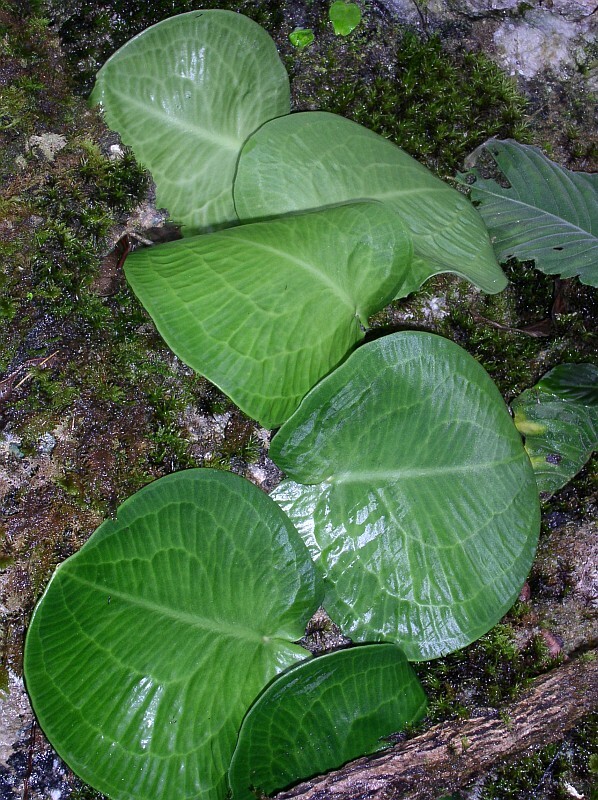 Caladium or Xanthosoma, Croat 101261. Figure 26. 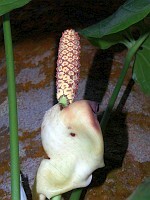 Caladium or Xanthosoma, Croat 101261. Figure 27. 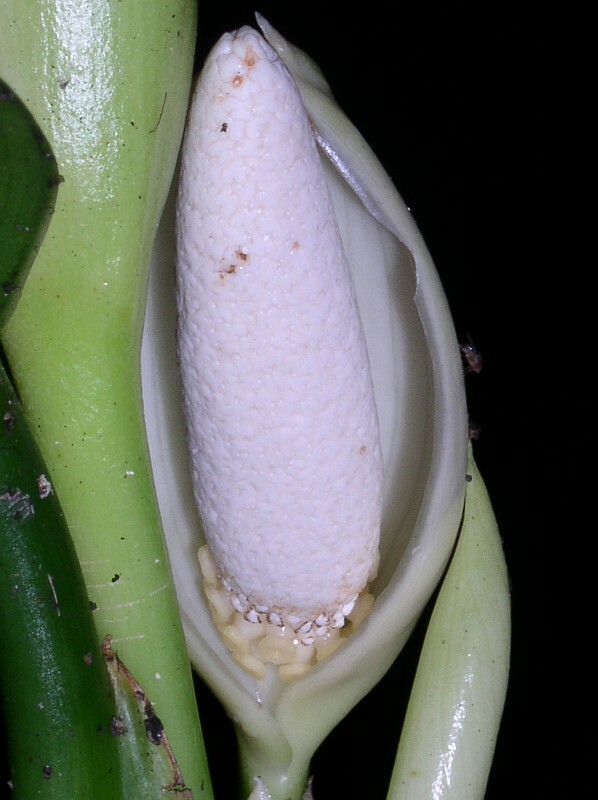 Dieffenbachia cf. killipii, Croat, 101268. Figure 28. Dieffenbachia cf. killipii, Croat, 101268. Figure 29. A sterile Dracontium species. Figure 30. Monstera gracilis Engl., Croat 101266. Figure 31. Monstera gracilis Engl., Croat 101266. 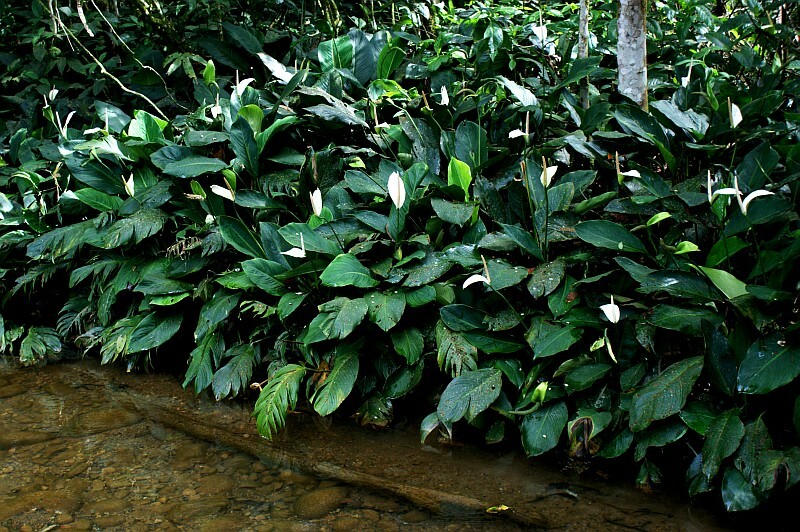 In addition to the rather common Anthurium gracile (Rudge) Schott and A. breviscapum Poepp. (Figs. 16-17, Croat 101256), A. pentaphyllum (Aubl.) G. Don. var. pentaphyllum (Figs. 18-19, Croat 101257) and A. formosum Schott (Figs. 20-21, Croat 101266) occur there. 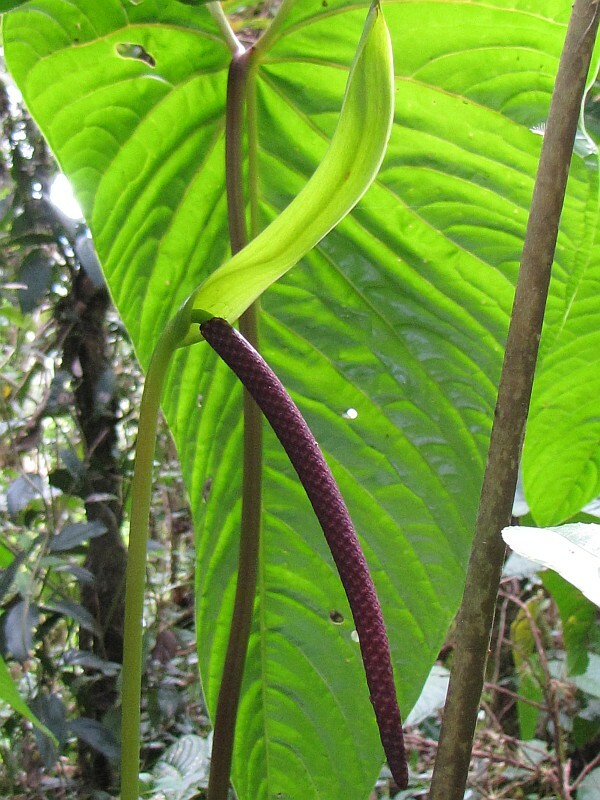 In addition there were at least two Anthurium section Pachyneurium in the area, one apparently A. atropurpureum Schultes & Maguire and the other probably A. uleanum Engl. 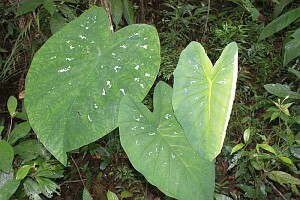 A very large Colocasioid, either Caladium or Xanthosoma had a peltate blade and was quite variable in coloration and the extent of its markings. 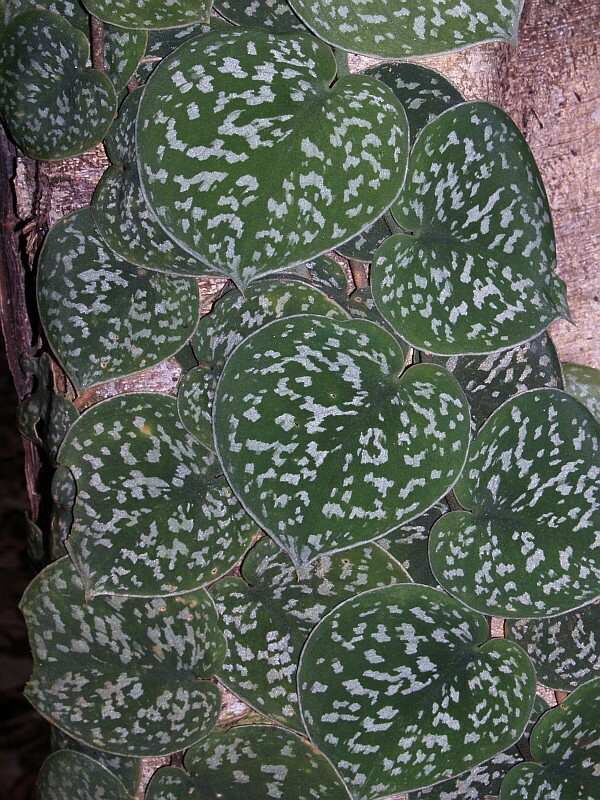 It is perhaps closest to Caladium bicolor but had blades much larger than any Caladium I have seen. 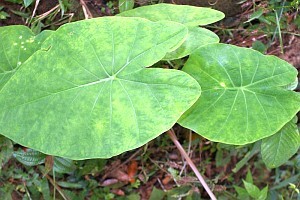 It had different color forms with solid leaves as well as variously spotted leaf blades (Figs. 22–26, Croat 101261). 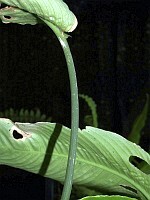 A Dieffenbachia, believed to be D. killipii Croat (Figs. 27–28, Croat 101268) was relatively common. 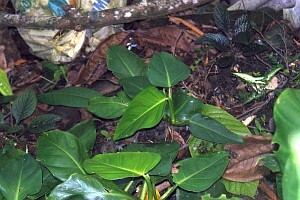 A sterile Dracontium species (Fig. 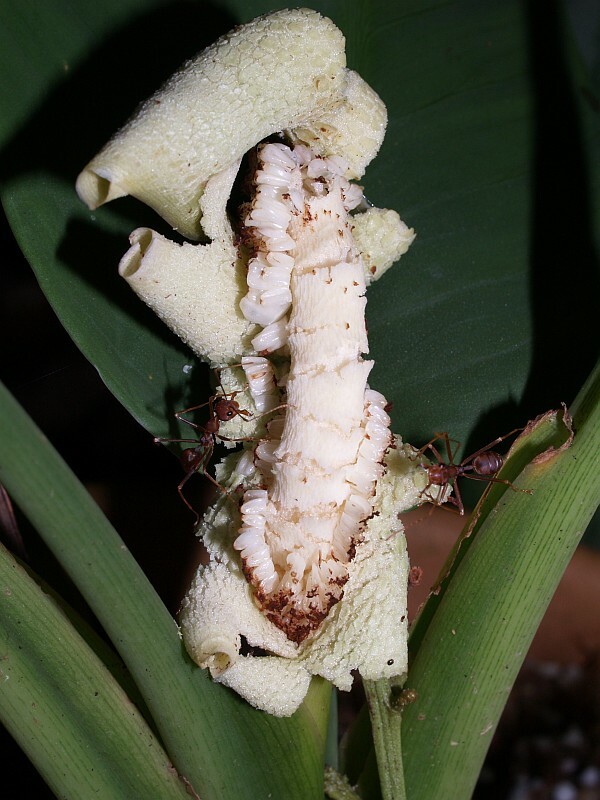 29) was found but the genus is difficult to determine with sterile material alone.There were several species of Monstera, one was Monstera gracilis Engl. (Figs. 30–32, Croat 101266) which had pinnae moderately broader than those on most collections. The other species resembled M. pinnatipartita Schott (Figs. 33–36, Croat 101262) but appeared to have broader and fewer pinnae. 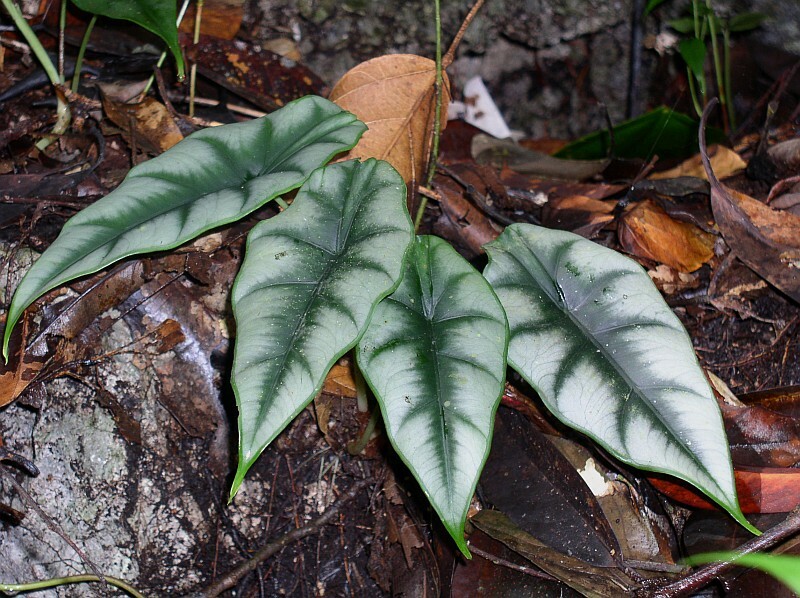 Philodendron was the most common genus in the area as is usually the case in the Amazonian lowlands. 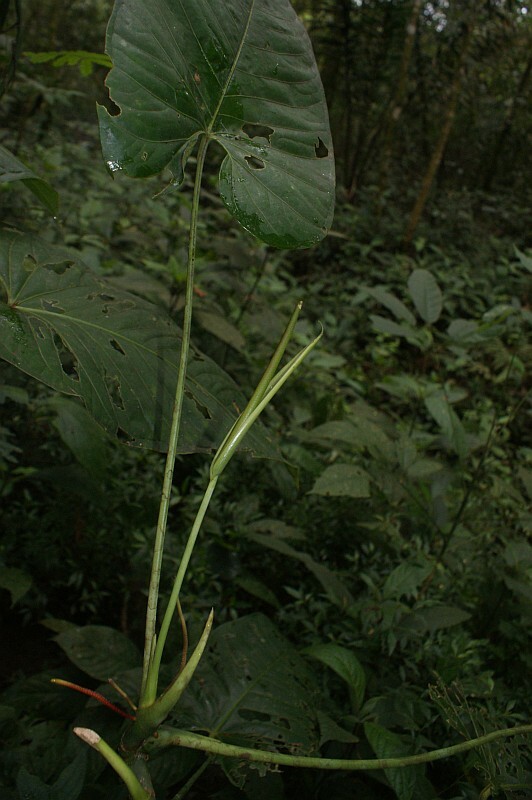 Other species seen were Philodendron fragrantissimum (Hook.) Kunth (Fig. 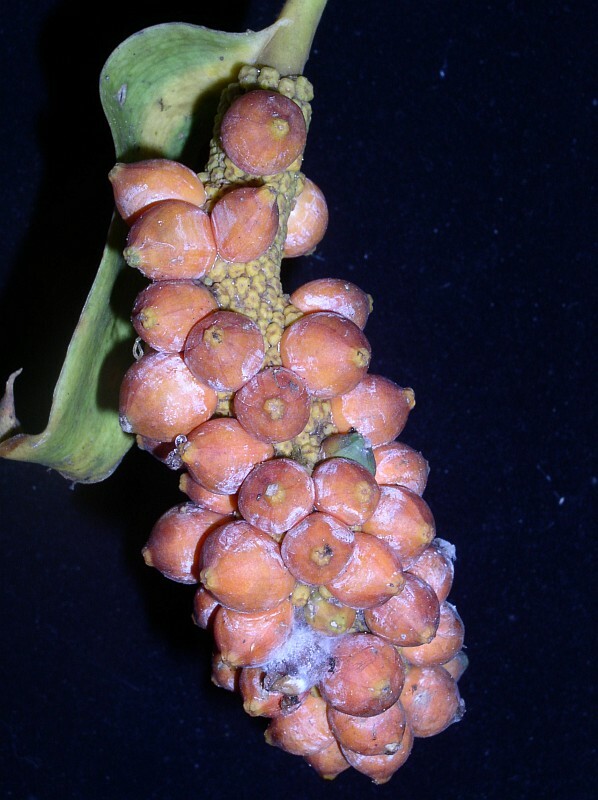 37, Croat 101258) with its bright red berries, P. ornatum Schott with its persistent cataphyll fibers and densely glanular petiole (Figs. 38–40, Croat 101268A), the juvenile form of P. barrosoanum G.S. Bunting (Figs. 41–42) with its sub-three-lobed leaf blades, P. deflexum Poeppig (Fig. 43), normally a relatively common species was seen only once. Spathiphyllum canniaefolium (Dryand.) Schott (Figs. 44–45, Croat 101259) was abundant everywhere but especially along the margin of streams. Figure 32. Monstera gracilis Engl., Croat 101266. Figure 33. 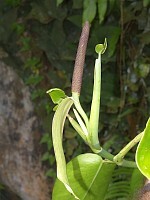 Monstera cf. pinnatipartita Schott, Croat 101262. Figure 34. Monstera cf. pinnatipartita Schott, Croat 101262. Figure 35. Monstera cf. pinnatipartita Schott, Croat 101262. Figure 36. Monstera cf. pinnatipartita Schott, Croat 101262. Figure 37. 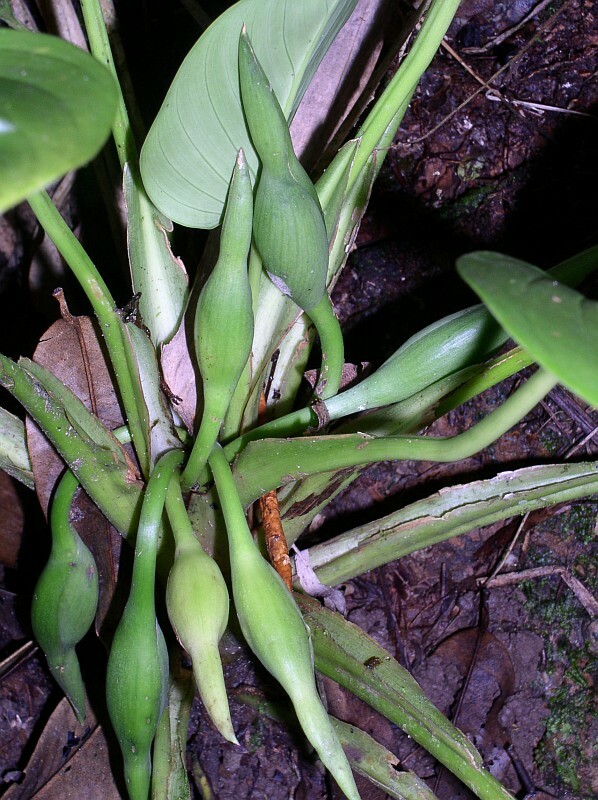 Philodendron fragrantissimum (Hook.) Kunth, Croat 101258. Figure 38. 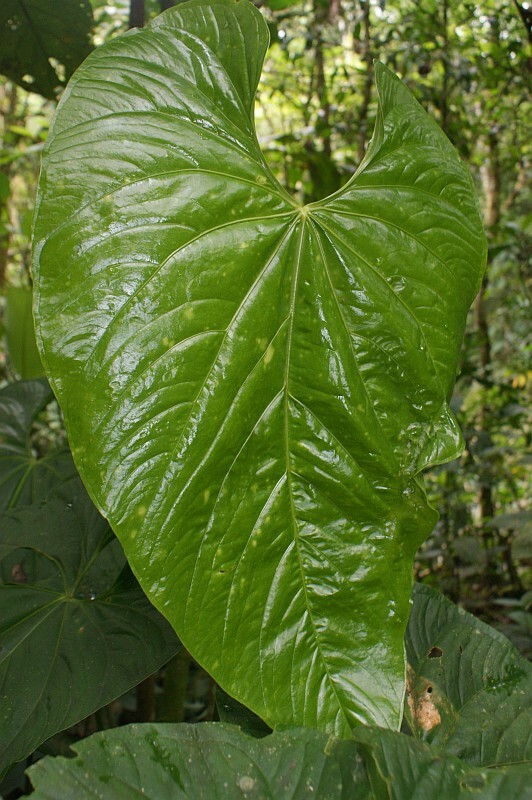 Philodendron ornatum Schott, Croat 101268A. Figure 39. Philodendron ornatum Schott, Croat 101268A. Figure 40. 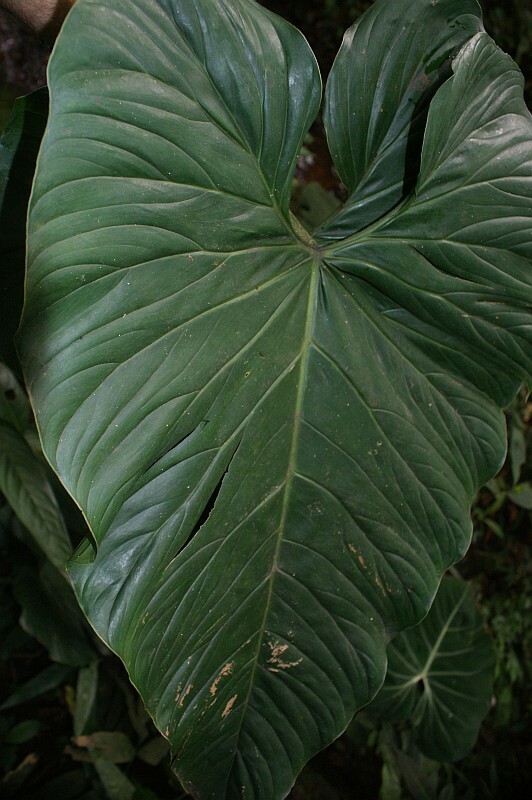 Philodendron ornatum Schott, Croat 101268A. Figure 41. 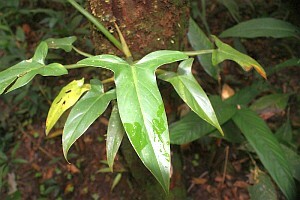 Juvenile form of Philodendron barrosoanum G.S.Bunting. Figure 42. 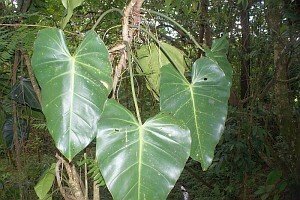 Juvenile form of Philodendron barrosoanum G.S.Bunting. Figure 43. 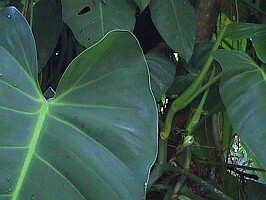 Philodendron deflexum Poeppig. Figure 44. 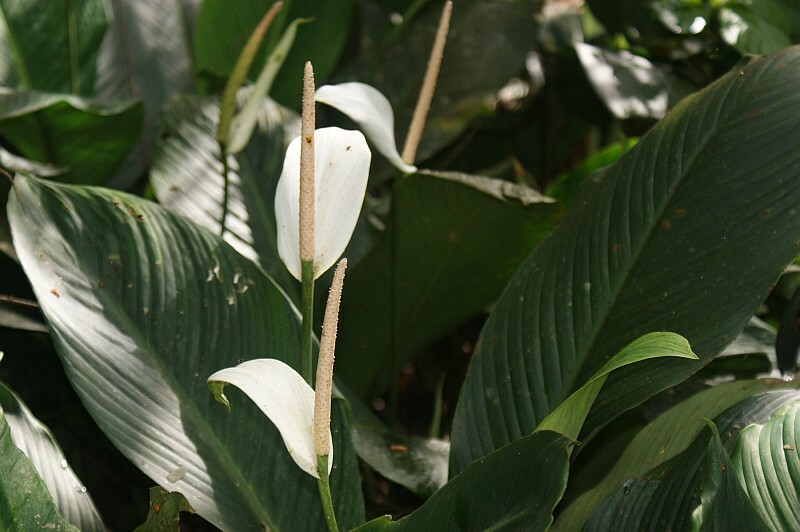 Spathiphyllum canniaefolium (Dryand.) Schott,Croat 101259. On my way back to Bogotá I visited the herbarium of the Universidad de los Llanos at the campus of the university west of the Terminal de Transporte. It was a productive event since only one single collection of Araceae among all the collections, had a correct determination. Figure 45. Spathiphyllum canniaefolium (Dryand.) Schott, Croat 101259. Returning to Bogotá I went with Alejandro to the San Andrecito shopping center, the major center of electronic material and especially pirated software, movies and video games. Alejandro knew a person there who offered to repair a couple of my old Sony cameras. I was pleased with the outcome since both were repaired and cleaned for about $150. With all my regular work done, I spent my last night photographing the undetermined Anthurium collections. Julio Betancur took me to the airport early the next morning and then what had been a good trip turned sour. Within 5 minutes of my arrival when I was trying to move my bags into the proper position in the Continental Airlines line, someone stole my computer. It was quite astonishing. I had moved no more than 2 meters with one of my big bags because the cart on which I had my bags was no longer maneuverable in the crowd. When I looked back at my cart, the computer bag had been removed and there was no one in sight carrying one. Despite rushing around asking everyone, the Continental Airline employees, the security guards and other bystanders in the area, no one claimed to have seen anything and no one seemed to give a damn. I was bitterly disappointed because I had lost nearly all my pictures taken during the trip. It is for this reason that this article has fewer pictures than is normal for my Newsletter articles. 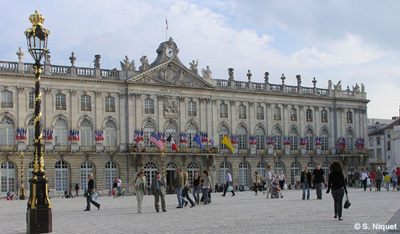 The registration fees include admission to all sessions, french breakfasts ( July 8,9 and 10), lunches ( July 8,9 and 10 ) and coffee breaks. 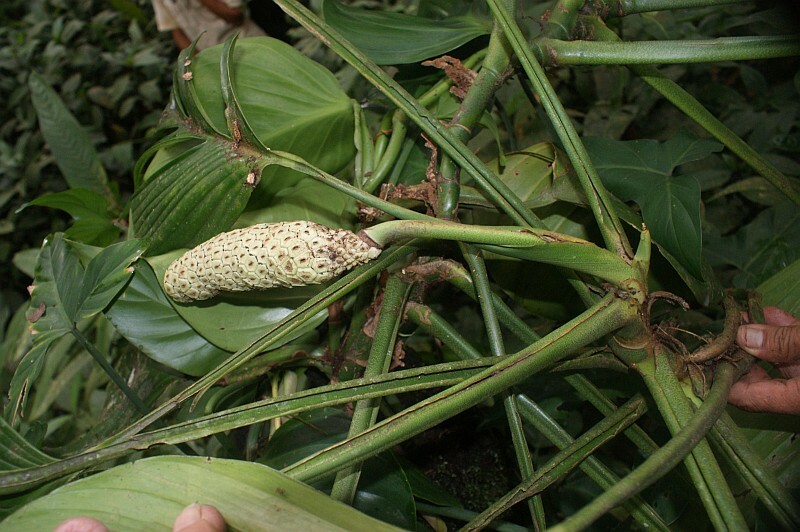 Peter BOYCE: Perspectives on the Araceae of Sunda: What do we really know? The International Aroid Society Inc.